14.4.2019 Succesfull breed Tityus serrulatus. 13.3.2019 Next spring spiderlings in our breed G-SPIDERS: Pterinochilus sp. Arusha. Just one month after mating our female did beautiful eggsack. 1.2.2019 Mating: Pterinochilus sp. Arusha. 9.2.2019 New offspring: Pseudoclamoris gigas. 2.2.2019 1. moult Pterinochilus lugardi (25.1.2019). 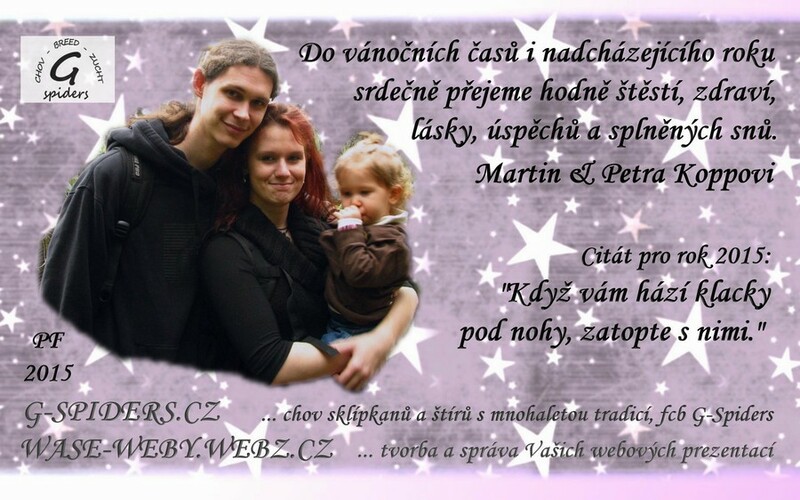 22.1.2019 Updated: Nejčastější otázky I (o sklípkanech obecně). We have new photos of following species: Ceratogyrus marshalli (dospělý samec - adult male), Encyocratella olivacea (dospělá samice - adult female), (dospělý samec - adult male), Euthycaelus colonica (samice s kokonem - female with eggsack) Harpactira marksi (dospělý samec - adult male), Harpactira sp. Silaka (dospělý samec - adult male), Lampropelma nigerrimum (dospělý samec - adult male), Lyrognathus giannisposatoi (dospělý samec - adult male), Poecilotheria tigrinawesseli (dospělý samec - adult male), Psalmopoeus emeraldus (7. svlek - 7. moult), (8. svlek - 8. moult), Pterinochilus murinus BCF (dospělý samec - adult male), Sericopelma melanotarsum (dospělý samec - adult male). 4.1.2019 To the New year with new offspring. 1.1.2019 our female Pterinochilus lugardi let go from an eggsack large, youngs in L2. The first birth of this young spider mummy. 5.11.2018 Succesfull mating Nebo yemensis. 3.11.2018 Tityus stigmurus are still in our offer. Tityus stigmurus. 28.10.2018 Succesfull mating and breed Buthus mallhomei. 27.10.2018 ANNOUNCEMENT OF THE SEPTEMBER COMPETITION. The unknown on the photo was: Sericopelma melanotarsum. We got only one right answer. Our congratulations and the prize goes to Matěj Slováček. 15.9.2018 This week we released into our offer spiderlings from our last breeding: Stromatopelma calceatum 1. moult - 2,5 € (NZ G-SPIDERS 1. moult 30.9.2018). 15.9.2018 Succesfull mating Androctonus australis hector. We have new photos of following species: Avicularia merianae (6. svlek - 6. moult), Brachypelma auratum (dospělá samice - adult female), (páření), Brachypelma baumgarteni (8. svlek - 8. moult), Brachypelma kahlenbergi (8. svlek - 8. moult), Ceratogyrus darlingi (4. svlek - 4. moult), Davus sp. (dospělá samice - adult female), Stromatopelma calceatum (samice s kokonem - female with eggsack). 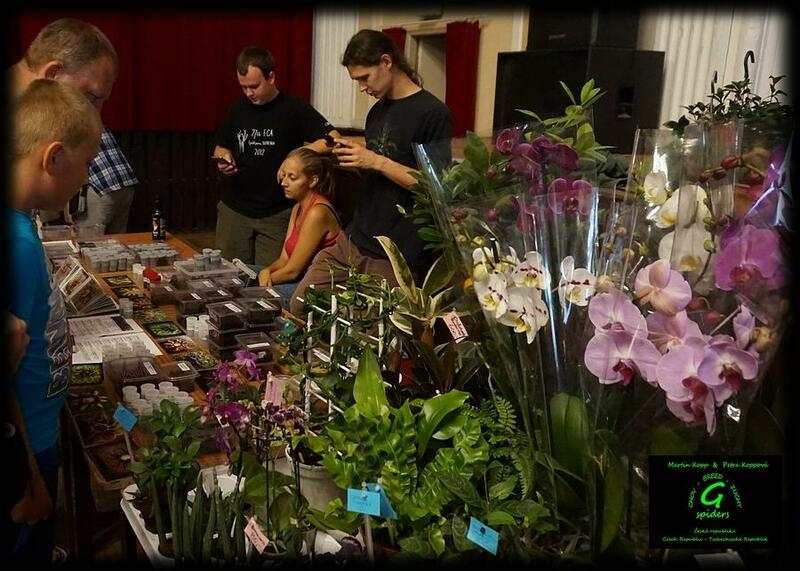 5.9.2018 Entering the competition for the month September 2018. 4.8.2018 Breed Uroplectes triangulifer marshalli! Uroplectes triangulifer marshalli. 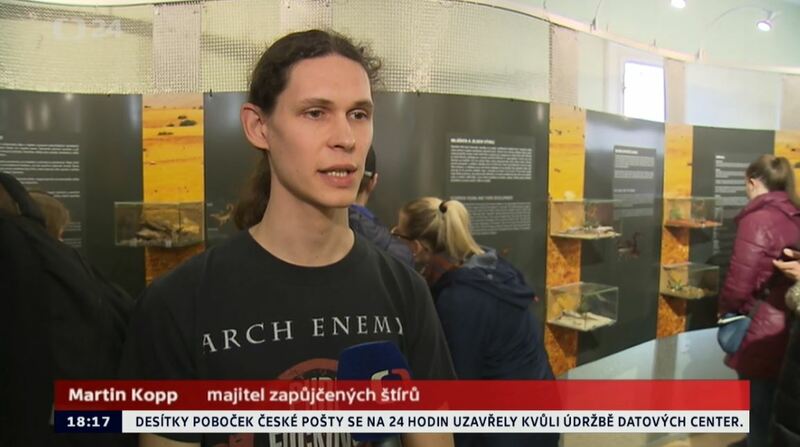 Všechna mláďata z obou odchovů se včera úspěšně svlékla do 1. svleku . 1.8.2018 Entering the competition for the month August 2018. 29.7.2018 Breed Uroplectes triangulifer marshalli! Uroplectes triangulifer marshalli. Momentálně máme v galerii štírů 116 druhů. 28.6.2018 New in our offer: Idiothele mira 1. moult 12 €. 31.5.2018 New in our offer: Cyriopagopus albostriatus 1. moult 8 €. 7.5.2018 We added new species: Heterometrus bengalensis, We currently have 115 species of scorpions in the Gallery. We have new photos of following species: Aphonopelma hentzi (dospělá samice - adult female), Avicularia sp. Rurrenabaque (dospělá samice - adult female), Euathlus sp. fire (6. svlek - 6. moult), Harpactira dictator (dospělá samice - adult female), Haplocosmia nepalensis (dospělá samice - adult female), Harpactira marksi (dospělá samice - adult female), Heterometrus mysorensis (dospělá samice - adult female), Heterometrus spinifer (dospělá samice - adult female), Heterothele gabonensis (7. svlek - 7. moult), Lampropelma violaceopes (3. svlek - 3. moult), Stromatopelma calceatum (dospělá samice - adult female), (dospělý samec - adult male), (terárium). 1.5.2018 G-Spiders wish beautiful first May. We have new photos of following species: Aphonopelma hentzi (dospělá samice - adult female), Avicularia sp. Rurrenabaque (dospělá samice - adult female), Brachypelma kahlenbergi (8. svlek - 8. moult), Ceratogyrus sanderi (7. svlek - 7. moult), Grosphus grandidieri (dospělá samice - adult female), Haplocosmia nepalensis (dospělá samice - adult female), Idiothele mira (dospělý samec - adult male), Lampropelma nigerrimum (7. svlek - 7. moult), Lyrognathus giannisposatoi (8. svlek - 8. moult), Poecilotheria miranda (samice s mláďetem - female with offspring), Pterinochilus murinus TCF (dospělá samice - adult female), (spermatheca). 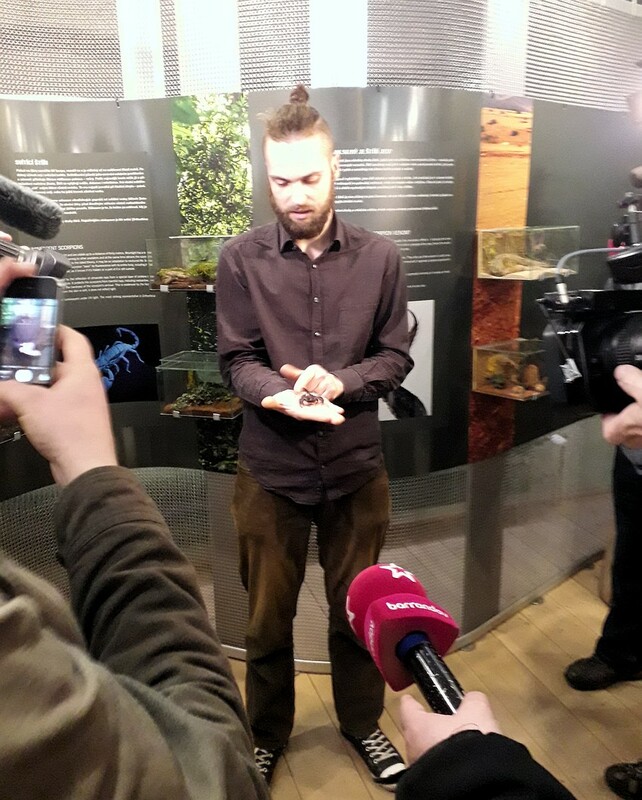 10.3.-27.5.2018 The implementation team of the ZOO Prague, headed by Vít Lukáš and Šimon Kapic, organized a unique scorpion exhibition. We have borrowed scorpions from our G-Spiders breed. 31.3.2018 A new version of the record sheet. 23.3.2018 We have new photos of following species: Androctonus bicolor (5. svlek - 5. moult), Avicularia juruensis (4. svlek - 4. moult), Avicularia merianae (4. svlek - 4. moult), Avicularia sp. Rurrenabaque (dospělá samice - adult female), Buthus mallhomei (dospělá samice - adult female), Buthus paris (dospělá samice - adult female), Pandinus imperator (terárium). a new version of the record sheet. Interview for the magazine Právo 11/2017. 1.1.2018 We offer 1.0 Pterinochilus lugardi: adult 12/2017, 12 €. It is the male in the photo. It hasn´t already mated. Current status: available. We offer 1.0 Harpactira pulchripes: adult 8/2017, 30 €. It is the male in the photo. It hasn´t already mated. Current status: available. 29.12.2017 Dear friends... we wish you marry christmas and peace, love, health and all the best to new year 2017! 14.11.2017 We have new photos of following species: Catumiri parvum (dospělý samec - adult male), Grammostola actaeon (4. svlek - 4. moult), Grammostola iheringi (4. svlek - 4. moult), (5. svlek - 5. moult), Harpactira pulchripes (dospělý samec - adult male), Poecilotheria metallica (dospělá samice - adult female), Haplocosmia himalayana (páření - mating), Pterinochilus murinus TCF (páření - mating), Kochiana brunnipes (páření - mating), Tapinauchenius gigas (páření - mating), (dospělá samice - adult female). 15.8.2017 Joyful event at G-SPIDERS breed. We have new offspring: Hadogenes paucidens. 3.8.2017 Summer taking pictures of Theraphosa apophysis. More photos in the gallery or at our facebook G-Spiders. 28.6.2017 We have new photos of following species: Aphonopelma anax (páření - mating), Caribena versicolor (10. svlek - 10. moult), Ceratogyrus meridionalis (páření - mating), Cyriocosmus aueri (10. svlek - 10. moult), Cyriopagopus sp. Hati Hati (6. svlek - 6. moult), Haplocosmia himalayana (samice s kokonem - female with eggsack), (7. svlek - 7. moult), (dospělý samec - adult male), (páření - mating), Harpactira dictator (6. svlek - 6. moult), Harpactira marksi (páření - mating), Harpactira pulchripes (6. svlek - 6. moult), Heterothele gabonensis (dospělá samice - adult female), (dospělý samec - adult male), Iridopelma hirsutum (páření - mating), Monocentropus balfouri (páření - mating), (dospělá samice - adult female), Orphnaecus dichromatus (dospělá samice - adult female), Pandinus imperator (5 cm v těle - 5 cm body-size), Phlogiellus sp. Erawan (páření - mating), Phlogiellus sp. Khao Chong (samice s kokonem - female with eggsack), Plesiopelma sp. Bolivie (dospělá samice - adult female), Poecilotheria smithi (6. svlek - 6. moult), Pterinochilus murinus RCF (dospělá samice - adult female), Sericopelma melanotarsum (spermatheca), Sericopelma sp. Azuero (10. svlek - 10. moult), Theraphosa apophysis (páření - mating), Xenesthis immanis (2. svlek - 2. moult). 22.6.2017 New in our offer: Heterothele gabonensis 1. moult 3 € (NZ G-SPIDERS). 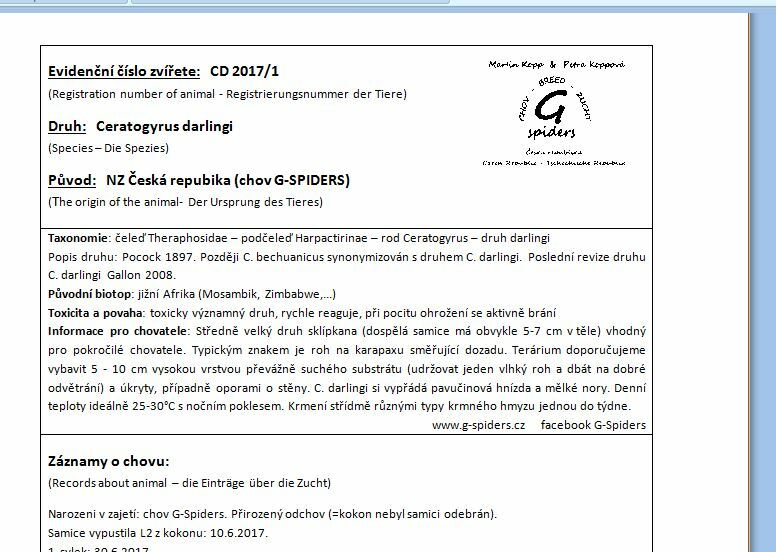 13.6.2017 We welcome our loved ones to the world - spiderlings Ceratogyrus darlingi. :-) They are currently examining the mother's web, which has cared for the eggsack for five weeks. 20.5.2017 We have new photos of following species: Haplocosmia nepalensis (dospělý samec - adult male), Harpactira marksi (dospělá samice - adult female), Hysterocrates hercules (dospělá samice - adult female), Chilobrachys sp. "dry" (7. svlek - 7. moult), Iridopelma hirsutum (dospělá samice - adult female), Lyrognathus giannisposatoi (6. svlek - 6. moult), Monocentropus balfouri (5. svlek - 5. moult), Pamphobeteus sp. Machala (5. svlek - 5. moult), Pandinus imperator (semiadult), Plesiopelma sp. Bolivie (dospělá samice - adult female), Cyriocosmus chicoi (dospělý samec - adult male), Pterinopelma sazimai (7. svlek - 7. moult), Selenocosmia arndsti (10. svlek - 10. moult), Stromatopelma calceatum (kokon - eggsack), Tapinauchenius sanctivincenti (dospělá samice - adult female), Theraphosidae sp. Panama (6. svlek - 6. moult). 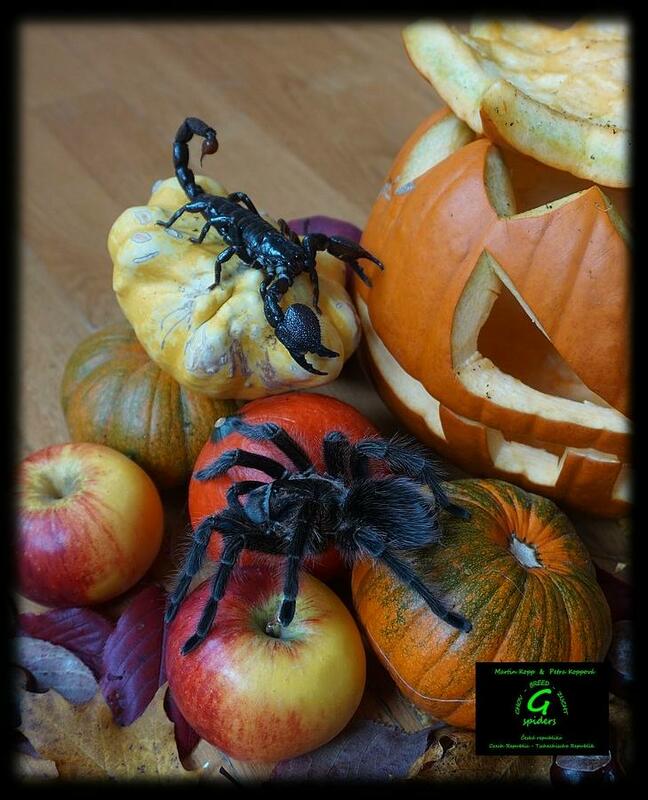 We offer adult X.0 Chilobrachys andersoni: adult 08-10/2016, from the breed G-SPIDERS, 6 €. It hasn´t already mated. 22.12.2016 Dear friends... we wish you marry christmas and peace, love, health and all the best to new year 2017! 13.12.2016 We have new photos of following species: Androctonus amourexi (dospělá samice - adult female), Aphonopelma anax (dospělá samice - adult female), Aphonopelma waconum (dospělá samice - adult female), Brachypelma baumgarteni (10. svlek - 10. moult), Cyriocosmus bertae (námluvy - before mating), Cyriocosmus chicoi (7. svlek - 7. moult), Cyriopagopus sp. Hati Hati (7. svlek - 7. moult), (dospělý samec - adult male), Heterothele gabonensis (dospělá samice - adult female), Cyriocosmus chicoi (dospělý samec - adult male). 30.10.2016 Successful mating Euathlus sp. yellow (male and female NZ, previous generation import Chile). 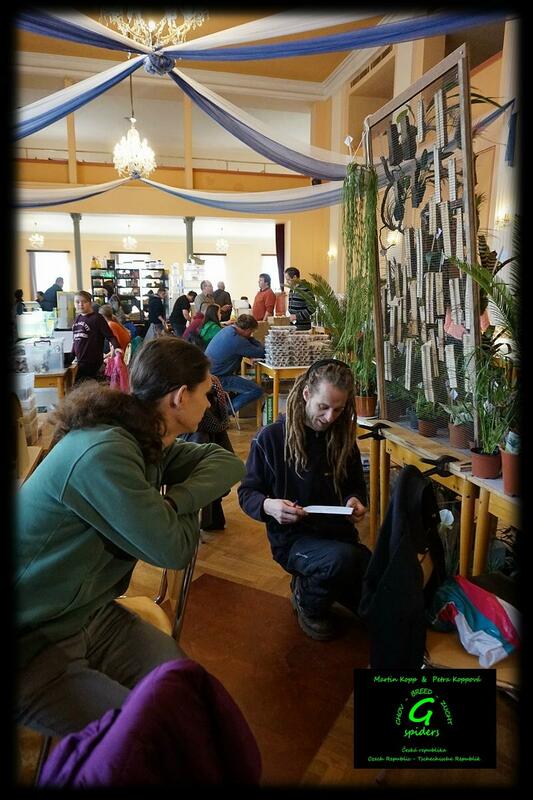 1.5.2016 These species are successfully mated... photos are in the photo gallery... please keep one's fingers crossed for us to we wait to see a little baby-spiders. :-) Aphonopelma sp. Azuero, Ceratogyrus darlingi, Ceratogyrus meridionalis, Hapalopus cf. formosus, Pamphobeteus ultramarinus. 18.4.2016 New adult male in our offer: 1,0 Cyriocosmus elegans - adult: 10.4.2016, 10 €. It hasn´t mated yet. It is the male in the photo. Current status: available. New adult male in our offer: 1,0 Lasiodorides polycuspulatus - adult: 15.4.2016, 17 €. It hasn´t mated yet. It is the male in the photo. Current status: available. 29.3.2016 We have new photos of following species: Avicularia diversipes (dospělý samec - adult male), Cyclosternum schmardae (samice s kokonem - female with her eggsack), Rhopalurus garridoi (samice s mláďaty (larvy) - female with offspring (nymphs)), (samec a samice s mláďaty (larvy) - male and female with offspring (nymphs)), Selenocosmia arndsti (9. svlek - 9. moult), Selenocosmia crassipes (12. svlek - 12. moult), Selenocosmia effera (samice s kokonem - female with her eggsack), Selenocosmia sp. Titiwanga (dospělá samice - adult female), Tapinauchenius plumipes (samice s mláďaty - female with offspring), Tapinauchenius plumipes (páření - mating), Theraphosa apophysis (9. svlek - 9. moult), Theraphosidae sp. Villa Tunari (námluvy - before mating), Theraphosidae sp. I (námluvy - before mating), Theraphosidae sp. III (dospělá samice - adult female), Theraphosa apophysis (9. svlek - 9. moult), Vitalius paraensis (samice 14. svlek - female 14. moult). 3.3.2016 We added new species: Buthus mallhomei, Buthus paris, Heterometrus kanaraensis, Heterometrus swammerdami, Liocheles sp. N, Parabuthus pallidus, Tityus graffini. We currently have 114 species of scorpions in the Gallery. 27.2.2016 Our female Avicularia diversipes is looking after her eggsack already three weeks. :-) We are hoping, we will wait to see little spiders soon. Breed Hottentotta jayakari (NZ G-SPIDERS 12/2015): born: 6.12.2015; 1. moult: 18.12.2015. :-) Now on the photo and in our offer: 2. moult - 11 €. 21.1.2016 Successfully mating of Haplopelma minax. :-) We hope, we will see a nice white ball. 11.1.2016 We offer 1.0 Chilobrachys sp. blue: adult 11/2015, 9 €. It is the male in the photo. It hasn´t already mated. Current status: available. We offer 1.0 Chilobrachys fumosus: adult 5.1.2016, 15 €. It is the male in the photo. It hasn´t already mated. Current status: you can book it. We offer 1.0 Brachypelma auratum: adult 12/2015, 13 €. It is the male in the photo. It has already mated. Current status: you can book it. We offer 1.0 Ceratogyrus meridionalis: adult 12/2015, 15 €. It is the male in the photo. It has already mated. Current status: you can book it. 10.1.2016 We added new links. 4.1.2016 We have new photos of following species: Aphonopelma sp. Azuero (dospělá samice - adult female), Brachypelma emilia (dospělý samec - adult male), Cyclosternum schmardae (dospělý samec - adult male), Grammostola pulchra (dospělá samice - adult female), Heterometrus cyaneus (dospělá samice - adult female), Hottentotta gentili (3. svlek - 3. moult), Hottentotta hottentotta (1. svlek - 1. moult), Hottentotta salei (3. svlek - 3. moult), Hysterocrates hercules (námluvy - before the mating), Leiurus quinquestriatus (dospělý samec - adult male), Nebo yemensis (3. svlek - 3. moult), Parabuthus liosoma (dospělá samice - adult female), Poecilotheria subfusca lowland (8. svlek - 8. moult), (dospělý samec - adult male), Poecilotheria regalis (L2), Psalmopoeus langebucheri (dospělý samec - adult male), Pterinochilus murinus RCF (1. svlek - 1. moult), Rhopalurus garridoi (samice s mláďaty (1. slvek) - female with offspring (1. moults)), Rhopalurus junceus (1. svlek - 1. moult), Rhopalurus princeps (samice s mláďaty (1. slvek) - female with offspring (1. moults)). 3.1.2016 Little spiders Cyriocosmus perezmilesi came into the world. :-) Our female Cyriocosmus perezmilesi opened her eggsack after a less than a month long care. 1.1.2016 All young Hottentotta jayakari are in 1. moult and they are hunting individually and actively. :-) We decided that the part of this litter will release for sale... 1. moult 11 €. 23.12.2015 Successful mating of Avicularia laeta (19.12.2015). We hope that this female will build a real eggsack after the false eggsack at the begin of this month. 7.12.2015 Another present under the Christmas tree... :-) :-) :-) Young female Cyriocosmus perezmilesi has looked after her first eggsack since this week. 6.12.2015 Christmas came soon this year... :-) :-) :-) Our female Hottentotta jaykari gave birth many nice healthy nymphs today. 1.12.2015 Species have mated in the autumn 2015: Grammostola pulchra, Chromatopelma cyaneopubescens, Chilobrachys sp. blue, Cyriocosmus perezmilesi, Poecilotheria metallica, Poecilotheria ornata, Poecilotheria regalis, Stromatopelma calceatum, ... please cross one's fingers for us. ;-) :-). 18.11.2015 We added this new species: Lyrognathus giannisposatoi, Pterinopelma sazimai. We currently have 311 species of tarantulas in the Gallery. We have new photos of following species: Aphonopelma waconum (3 cm v těle - 3 cm body-size), Brachypelma annitha (7. svlek - 7. moult), Brachypelma baumgarteni (6. svlek - 6. moult), (7. svlek - 7. moult), Brachypelma boehmei (5. svlek - 5. moult), Brachypelma kahlenbergi (8. svlek - 8. moult), Ceratogyrus meridionalis (7. svlek - 7. moult), Encyocratella olivacea (7. svlek - 7. moult), Psalmopoeus irminia (6. svlek - 6. moult), (dospělý samec - adult male), Psalmopoeus pulcher (3. svlek - 3. moult). We added new species: Nebo yemensis, Orthochirus innesi. We currently have 109 species of scorpions in the Gallery. We added this new species: Chilobrachys sp. Kaeng Krachan, Pamphobeteus sp. Machala. We currently have 309 species of tarantulas in the Gallery. We have new photos of following species: Pamphobeteus nigricolor (dospělá samice - adult female), (páření - mating), Pamphobeteus vespertinus (1. svlek - 1. moult), (3. svlek - 3. moult), Phormictopus antillensis (10. svlek - 10. moult), Phormictopus auratus (páření - mating), (spermatheca), Poecilotheria metallica (dospělá samice - adult female), Poecilotheria regalis (3. svlek - 3. moult), Psalmopoeus irminia (4. svlek - 4. moult), (dospělá samice - adult female). We have new photos of following species: Haplocosmia himalayana (4. svlek - 4. moult), Harpactira marksi (1. svlek - 1. moult), Heterometrus petersi (samice s mláďaty (larvy) - female with offspring (nymphs), (páření - mating), Hoffmannius punctatus (6. svlek - 6. moult), Hysterocrates hercules (4. svlek - 4. moult), Hysterocrates gigas (dospělá samice - adult female), Chilobrachys sp. "dry" (3. svlek - 3. moult), Chilobrachys andersoni (dospělá samice - adult female), (spermatheca), Idiothele nigrofulva (páření - mating), Leiurus quinquestriatus (dospělá samice - adult female), Megaphobema robustum (7. svlek - 7. moult), Metriopelma familiare (dospělá samice - adult female), Monocentropus balfouri (dospělý samec - adult male), Nhandu tripepii (3. svlek - 3. moult), (4. svlek - 4. moult). 10.10.2015 We added new species: Centruroides hoffmani, Compsobuthus acutecarinatus. We currently have 107 species of scorpions in the Gallery. 2.10.2015 We have new photos of following species: Avicularia versicolor (5. svlek - 5. moult), Brachypelma klaasi (5. svlek - 5. moult), (5. svlek - 5. moult), Coremiocnemis brachyramosa (dospělá samice - adult female), Cyriocosmus chicoi (dospělý samec - adult male), Cyriocosmus perezmilesi (6. svlek - 6. moult), Cyriopagopus schioedtei (6. svlek - 6. moult), Cyriopagopus sp. Hati Hati (4. svlek - 4. moult), Ephebopus cyanognathus (1. svlek - 1. moult), (3. svlek - 3. moult), Eresus sp. Pelopones (páření - mating), Grammostola pulchripes (9. svlek - 9. moult), Hapalopus triseriatus (dospělý samec - adult male), Hapalopus triseriatus lowland (samice 10. svlek - female 10. moult), (dospělý samec - adult male), Haplopelma schmidti (dospělá samice - adult female), (dospělá samice - adult female), Haplopelma sp. Surat Thani (dospělá samice - adult female). 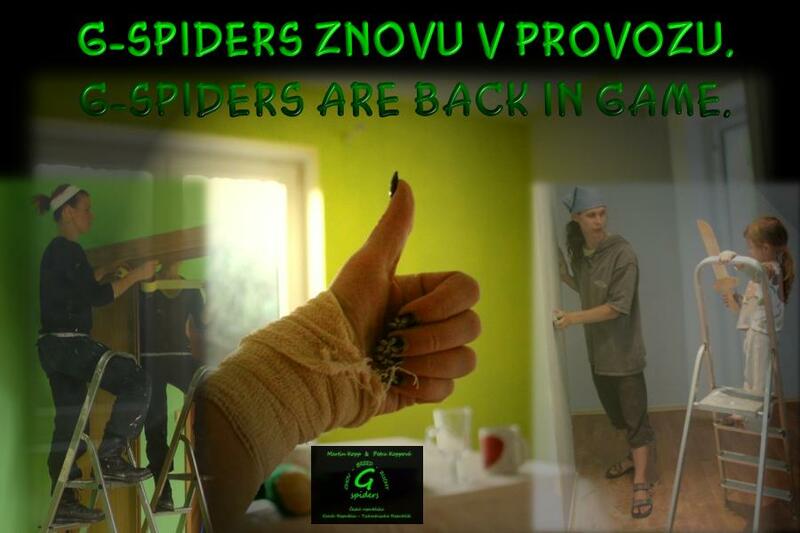 29.8.2015 G-SPIDERS ARE BACK - WE WILL BEGIN WITH TERA ČB 30.8.2015!!! We finisher our moving into new house successfully. :-) Well at last! Internet connection is arranged, our pets with eight legs are making just two rooms homely... we are back again! 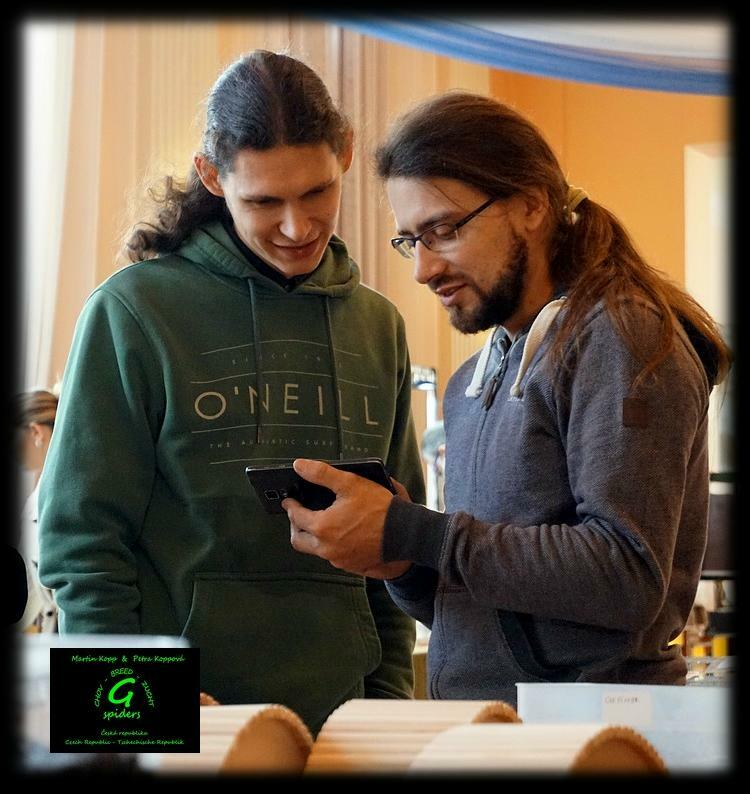 :-) We are asking your for patience about the answering your emails and messages... we have ammased over five hundert messages yet. Thank you. ČERVEN - ČERVENEC - SRPEN 2015 We are mowing into new house and we are out of internet connection. 10.7.2015 Hysterocrates hercules are mated successfully. :-) Photos of the mating here: Hysterocrates hercules, námluvy - before the mating, Hysterocrates hercules, páření - mating, Hysterocrates hercules, páření - mating. Scorpions Hottentotta jayakari are mated successfully. :-) It is our firm belief that we will see the young soon. Photos of the mating here: Hottentotta jayakari; páření - mating, páření - mating, spermatofor. Adult male in our offer: 1.0 Hapalopus triseriatus (adult 01/2015; 5 €; It hasn´t mated yet. ; Current status: available.) It is the male in the photo: Hapalopus triseriatus, dospělý samec - adult male. Adult male in our offer: 1.0 Avicularia avicularia (adult 04/2015; 7 €; It hasn´t mated yet. ; Current status: available.) It is the male in the photo: Avicularia avicularia, dospělý samec - adult male. Adult male in our offer: 1.0 Aphonopelma sp. Azuero (adult 2.5.2015; 10 €; It successfully mated our females. ; Current status: you can book it.) Photo of the male: Aphonopelma sp. Azuero, dospělý samec - adult male. We added photos from 50. 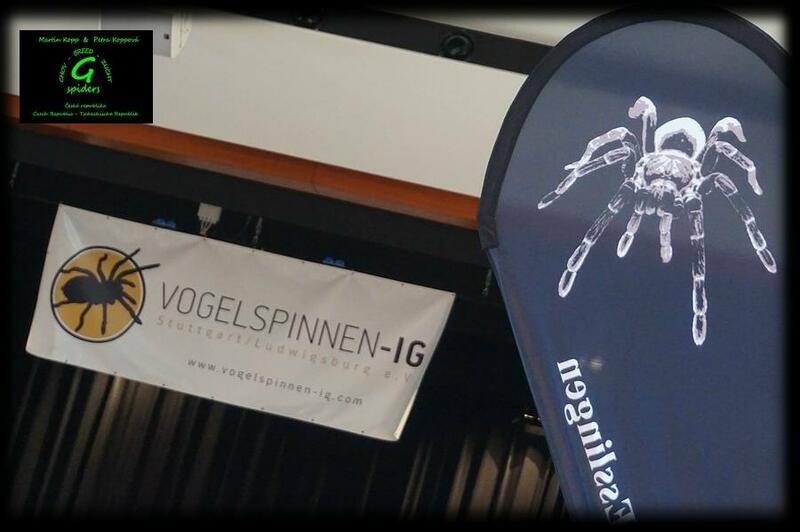 Internationale Vogelspinnenbörse into the section Bonus. 1.7.2015 We have new photos of following species: Acanthoscurria geniculata (10. svlek - 10. moult), (námluvy - before the mating), Acanthoscurria natalensis (spermatheca), Avicularia geroldi (2. svlek - 2. moult), (3. svlek - 3. moult), Avicularia laeta (10. svlek - 10. moult), Avicularia purpurea (4. svlek - 4. moult), Brachypelma annitha (5. svlek - 5. moult), Brachypelma baumgarteni (3. svlek - 3. moult), (5. svlek - 5. moult), Brachypelma vagans (páření - mating). 30.6.2015 ANNOUNCEMENT OF EVENT. We got 6 right answers during the last turn. We drew these three winners: Vít Petrželka - Jaroslav Marek - Ivo Polcr. Congratulations! 10.6.2015 ANNOUNCEMENT OF EVENT. We got 7 right answers during the last turn. We drew these three winners: Petr Pietrasz - Josef Spousta - Daniel Trojan. Congratulations! 17.5.2015 We accept a reservations for 1.0 Hysterocrates hercules. Adult 2/2015. 9 €. It successfully mated our female. It is the male in the photo: 1.0 Hysterocrates hercules. 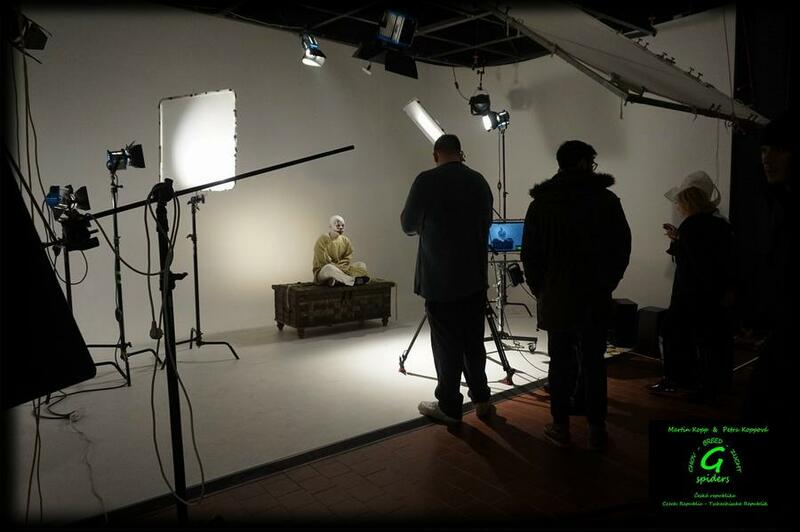 We added two new links into the section FILMING. 8.5.2015 ANNOUNCEMENT OF EVENT. We got 11 right answers during the last turn. We drew these three winners: Ivo Polcr - Marek Kučera - Vít Petrželka. Congratulations! 9.4.2015 ANNOUNCEMENT OF EVENT. We got 6 right answers during the March turn. We drew these three winners: Jaroslav Marek, Radmil Podlaha and Vladimír Pavlas. Congratulations! 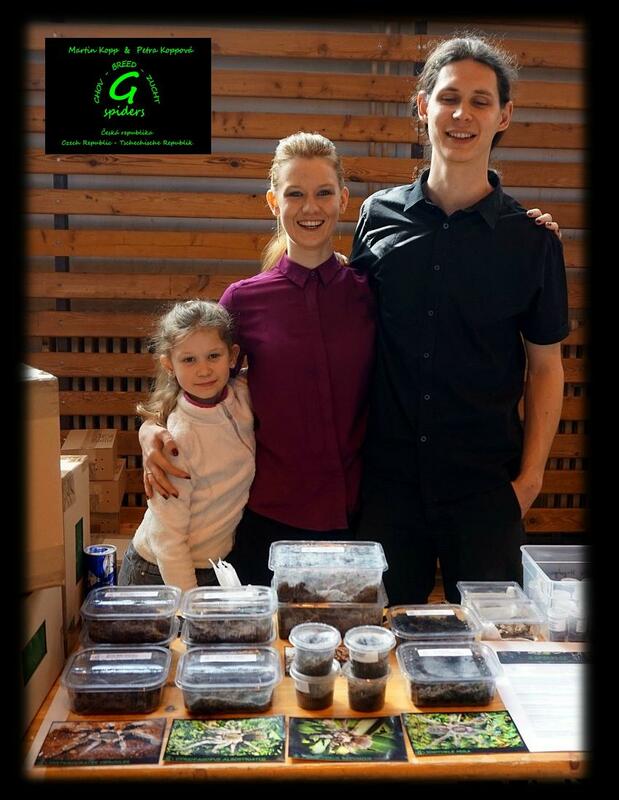 8.4.2015 We managed to get better price from Ceska pošta. 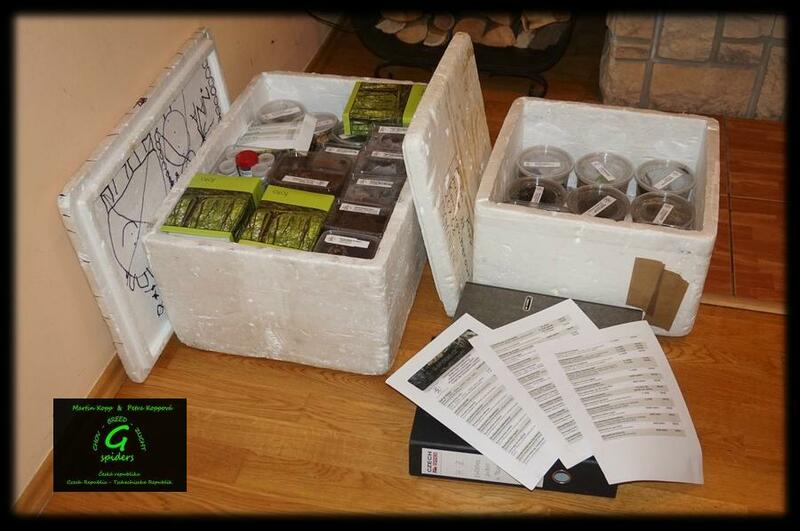 Current postage for CZ is 155 CZK for post office + 50 CZK for heatpack + 10 CZK for box. 17.3.2015 We have new photos of following species: Eresus sp. Peloponés (dospělá samice - adult female), Pamphobeteus nigricolor (dospělá samice - adult female), (spermatheca), Phlogiellus sp. Palawan (dospělá samice - adult female), Phormictopus cubensis (dospělá samice - adult female), (spermatheca), Poecilotheria miranda (7. svlek - 7. moult), Poecilotheria rufilata (7. svlek - 7. moult), Poecilotheria smithi (7. svlek - 7. moult), Psalmopoeus langebucheri (4. svlek - 4. moult), Selenocosmia arndsti (9. svlek - 9. moult), Sericopelma sp. Meg (9. svlek - 9. moult), Tapinauchenius gigas (5. svlek - 5. moult), (6. svlek - 6. molt), Theraphosa apophysis (7. svlek - 7. moult). 15.3.2015 We have new photos of following species: Acanthoscurria antillensis (7. svlek - 7. moult), Acanthoscurria juruenicola (dospělá samice - adult female), Brachypelma auratum (dospělá samice - adult female), Brachypelma baumgarteni (2. svlek - 2. moult), Ceratogyrus marshalli (4. svlek - 4. moult), Cyriocosmus bertae (6. svlek - 6. molt), (7. svlek - 7. moult), Cyriopagopus sp. Hati Hati (5. svlek - 5. moult), Grammostola actaeon (samice 9. svlek - female 9. moult) Haplocosmia himalayana (6. svlek - 6. moult), Haplopelma minax (2. svlek - 2. moult), Hysterocrates hercules (dospělá samice - adult female), Chilobrachys fumosus (dospělá samice delší dobu po svleku - adult female long time after moulting), Chromatopelma cyaneopubescens (10. svlek - 10. moult), Kochiana brunnipes (samice 10. svlek - female 10. moult), (spermatheca), Lasiodora fracta (dospělá samice - adult female), Megaphobema robustum (7. svlek - 7. moult). 12.3.2015 We add new link ABOUT US. The english translation will be added. 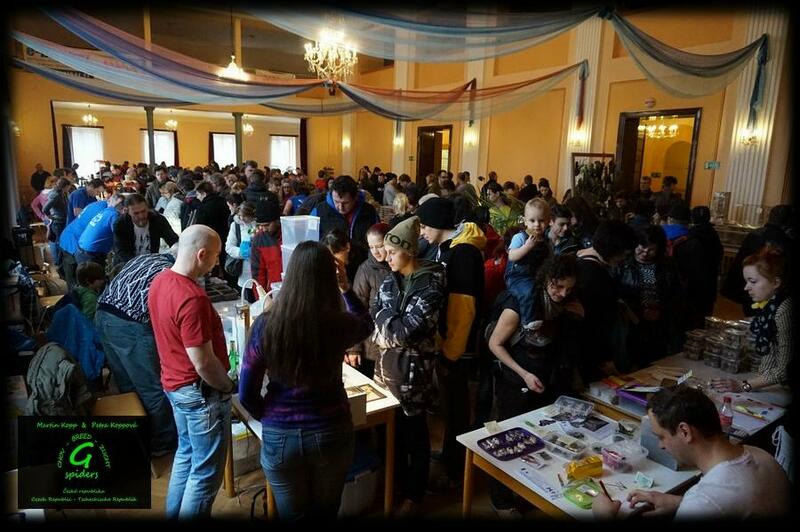 8.2.2015 Ceska posta put up the prices - the postage is 5 CZK higher in Czech Republic. 7.2.2015 We added this new species: Heterothele gabonensis, Chilobrachys sp. "dry", Oligoxystre diamantinensis, Tapinauchenius sanctivincenti. We currently have 306 species of tarantulas in the Gallery. 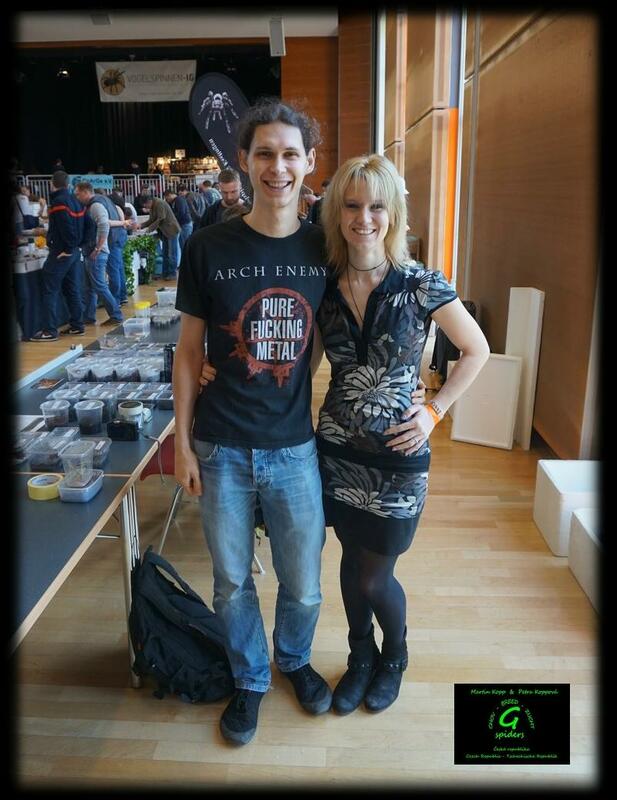 4.2.2015 We had two strangenesses in our Event at the turn of the year. The first - we skipped the round in Decebmer for extreme workload sinc half od November. The second - we got no right answer neither in November nor in January, although we got many responses. Thus we decided, the round in February will be relaxed. :-) We look forward to your answers. 18.1.2015 Spiderlings Tapinauchenius plumipes are for sale: 1. moult - 6 € (NZ G-SPIDERS 01/2015). Female - NZ Czech Republic, her second eggsack. Male - NZ Germany. She has cared her eggsack since end of November. NATURAL BREED - the eggsack wasn´t taken away from the female. 29.12.2014 she opened her eggsack. Moulting into 1. moult: 7.1.2015 (around 1,5 cm in legspan). 10x 1. moult - 40 € The photo of this offspring 11.1.2015: ZDE. The photo of the female: ZDE. 11.1.2015 We accept reservations: Tapinauchenius plumipes 1. moult - 6 € (NZ G-SPIDERS 01/2015). Spiderlings are learning to hunt and they are keeping near female in her nest. Female - NZ Czech Republic, her second eggsack. Male - NZ Germany. She has cared her eggsack since end of November. NATURAL BREED - the eggsack wasn´t taken away from the female. 29.12.2014 she opened her eggsack. Moulting into 1. moult: 7.1.2015 (around 1,5 cm in legspan). 10x 1. moult - 40 € The photo of this offspring 11.1.2015: ZDE. The photo of the female: ZDE. 3.1.2015 Our female Tapinauchenius plumipes opened her eggsack 29.12.2014. This is her second successful breed. We estimate, there are over one hundred spiderlings. Our female has cared her eggsack since end of November. Photo of the offspring: Tapinauchenius plumipes (samice otevřela kokon a brání mláďata ve stadiu L2 - female opened her eggsack and defends her spiderlings L2). Wir bringen eine nächste Runde unseres Wettbewerbs nach einer einmonatigen Pause. 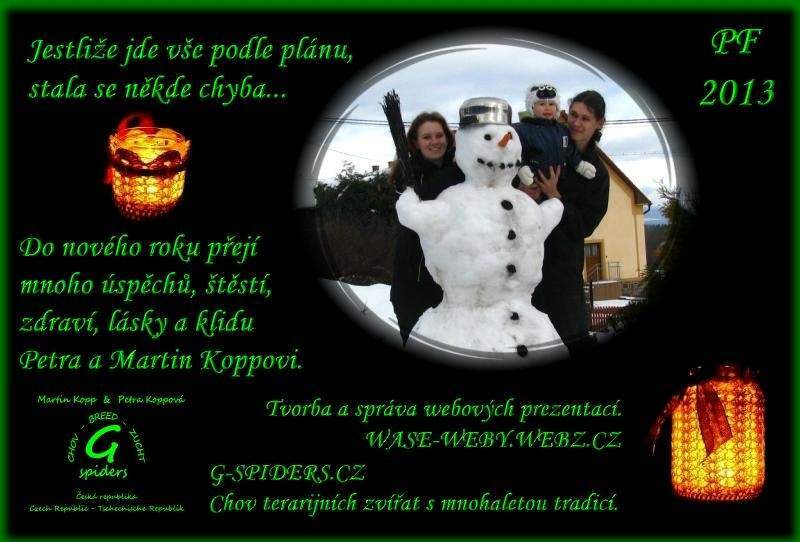 Die Einzelheiten: g-spiders.cz, WETTBEWERB. 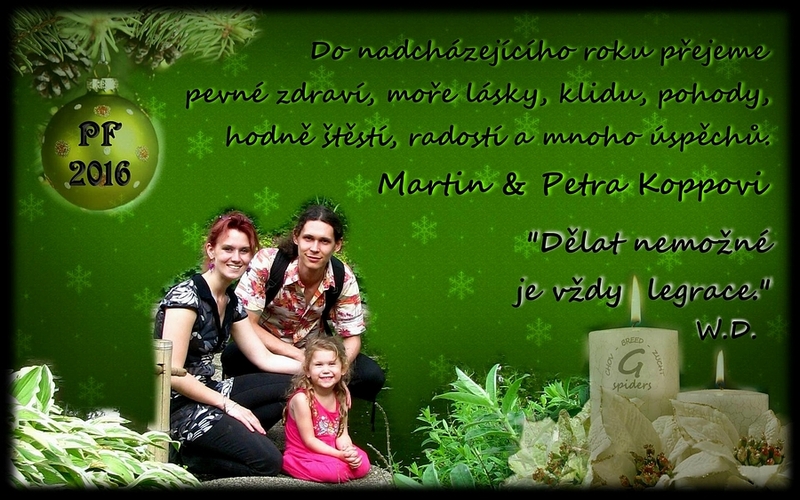 20.12.2014 Dear friends... we wish you marry christmas and peace, love, health and all the best to new year 2015! 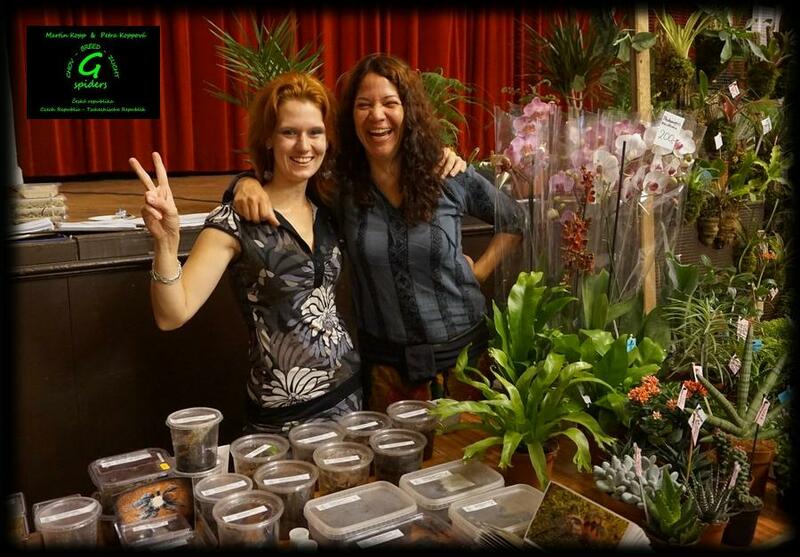 We thank you for your favour and for your likes for our presentation on facebook G-Spiders. Also we thank you for cooperation with us and we look forward to next time. 25.11.2014 Our youngh of Heterometrus cyaneus are successfully moulting to 1. moult. :-) Photo of the offspring here: Heterometrus cyaneus (1. svlek - 1. moult). 16.11.2014 Our female of Rhopalurus junceus gave birth to many nice big nymphs last week. They are successfully moulting to 1. moult right now. :-) Photo of the offspring here: Rhopalurus junceus (samice s mláďaty (larvy) - female with offspring (nymphs)). New in our offer: 1.0 Avicularia laeta (adult: 5.11.2014) Photo of the male here: Avicularia laeta (dospělý samec - adult male), Avicularia laeta (dospělý samec - adult male). New in our offer: 1.0 Vitalius paraensis (adult: 14.11.2014) Photo of the male here: Vitalius paraensis (dospělý samec - adult male). 16.11.2014 We have new photos of following species: Aphonopelma anax (kokon - eggsack), Aphonopelma sp. Azuero (11. svlek - 11. moult), Avicularia diversipes (samice - female), Cyriopagopus schioedtei (6. svlek - 6. moult), Cyriopagopus sp. Hati Hati (3. svlek - 3. moult), Euathlus sp. žlutý (10. svlek - 10. moult), Haplopelma sp. Bachma (dospělý samec - adult male), Idiothele nigrofulva (dospělá samice - adult female), Lasiodorides polycuspulatus (13. svlek - 13. moult), Lasiodora fracta (dospělá samice - adult female), (spermatheca), Ornithoctonus aureotibialis (5. svlek - 5. moult), Pandinus imperator (3. svlek - 3. moult), Phlogiellus sp. Tam Dao (dospělý samec - adult male), (námluvy - before the mating), (páření - mating), Plesiopelma sp. Bolivie (samice 13. svlek - female 13. moult), Poecilotheria rufilata (5. svlek - 5. moult), (6. svlek - 6. moult), Rhopalurus garridoi (páření - mating), Selenocosmia samarae (6. svlek - 6. moult), Vitalius paraensis (14. svlek - 14. moult). 5.11.2014 We got a right answer from twenty-five contestants! Now we are wondering how many friends of spiders will know who is showing one's teeth this month. ANNOUNCEMENT OF EVENT. Phormictopus auratus in 3.-4 molt won: Milan Kilián, Daniel Kohl, Lucie Bočková. The Unknown for the month October was Poecilotheria rufilata. We got right answers from these participants: Jaroslav Marek, Jiří Besperát, Jaroslav Patlejch, František Bednář, David Kuder, Jan Dvořák, Milan Kilián, Václav Janošek, Markéta Bucherová, Martina Gottwaldová, Daniel Kohl, Lucie Bočková, Oldřich Kyjovský, Michael Ferenc, Jakub Mára, Tomáš Boček, Jan Simperk, Josef Adam, Ivo Polcr, Jarmila Vrtlíková, Zuzana Mikulášová, Jan Machar, Lukáš Hladký, Veronika Gaherová Levorová, Pavlína Hegarová. 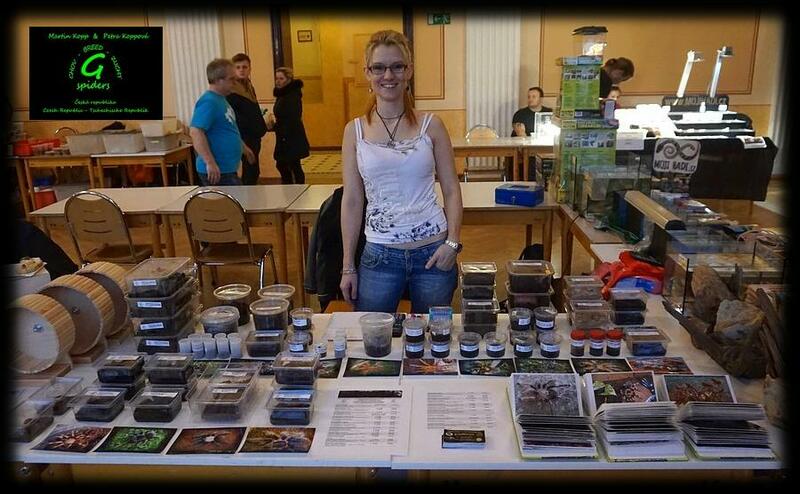 4.11.2014 Changes in taxonomy: Poecilotheria bara syn. with Poecilotheria subfusca. We keep terms P. subfusca highland / P. sibfusca lowland. Poecilotheria pederseni is Poecilotheria vittata now. Both of changes according to: Gabriel, Gallon & Smith, 2013. Last chance - you can to send your tips and you can to participate in our event. The deadline is tomorow and we will draw three winners. 22.10.2014 Another good piece of news in this week. :-) Our male Eupalaestrus weijenberghi was in the mating successful - we lent him for a half of eggsack. Now we can offer his offspring: 1. moult - 6,5 €. Photo of our male, when he was in 9. moult: Eupalaestrus weijenberghi (9. svlek - 9. molt). 19.10.2014 Well at last! :-) Our female Bracheplma vagans opened her eggsack tonight. Right now young are molting from L2 to 1. moult. Offspring will be for sale: 1. moult - 1,5 € (10x 13 €, 30x 22 €). Photo of the offspring here: Brachypelma vagans (samice s mláďaty (L2 + 1. slvek) - female with offspring (nymphs + 1. moults)), Brachypelma vagans (larvy a 1. svleky - nymphs and 1. moults). 14.10.2014 ANNOUNCEMENT OF EVENT. Psalmopoeus irminia in 1. molt won: Jarmila Vrtlíková, Vilém Holeček, Lucie Bočková, Jan Simperk, Martina Gottwaldová, Nikola Zbořilová. The Unknown for the months August + September was Idiothele nigrofulva. 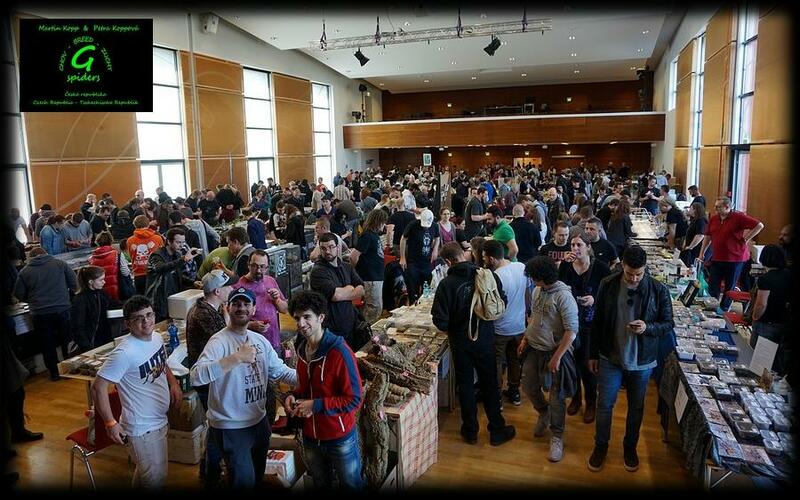 Because we were on holidays on the end of the month, we can´t the event to announce. We prolonged the deadline to the end of September. Now we draw six winners (three for every month). We got right answers from these participants: Nela Dvořáková, Jarmila Vrtlíková, Vilém Holeček, Oldřich Kyjovský, Ivo Polcr, Nikola Zborníková, Martina Gottwaldová, Oto Zimmermann, David Kuder, Roman Oláh, Jan Simperk, Klára Schejbalová, Veronika Gaherová Levorová, Lucie Bočková, Filip Sigmund, Michal Kosovský. Pleasant live out autumn wish G-SPIDERS to you. 17.9.2014 Successful breeding Pandinus sp. Uganda! 17.8.2014 our female gave birth to eight big nymphs. Now we have seven nice scorpions in 1. moult (moulting at the beginning of September). Of course a few young will stay at home. ;-) The rest of them are for sale for 9 €. Photo of the offspring here: Pandinus sp. Uganda (samice s mláďaty (larvy) - female with offspring (nymphs)), Pandinus sp. Uganda (samice s mláďaty - female with offspring). 13.9.2014 our female of Rhopalurus garridoi gave birth to many beautiful offspring. We accept advance bookings now - part of offspring will be for sale. Photo of the offspring here: Rhopalurus garridoi (samice s mláďaty (larvy) - female with offspring (nymphs)). 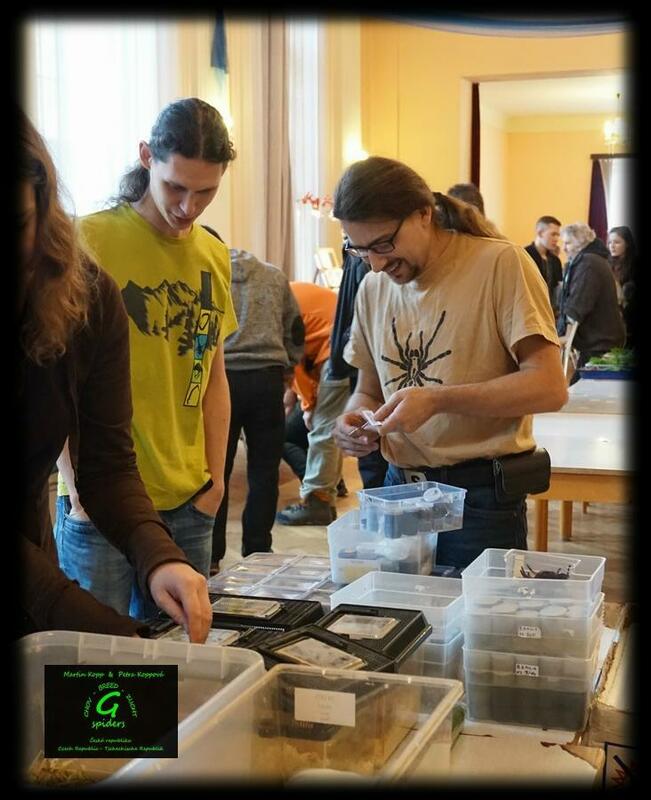 11.9.2014 INFO ABOUT OUR EVENT: because we were on holidays on the end of the month, we can´t the event to announce. We prolong the deadline to the end of September. On the end of September we will draw six winners (three for every month). 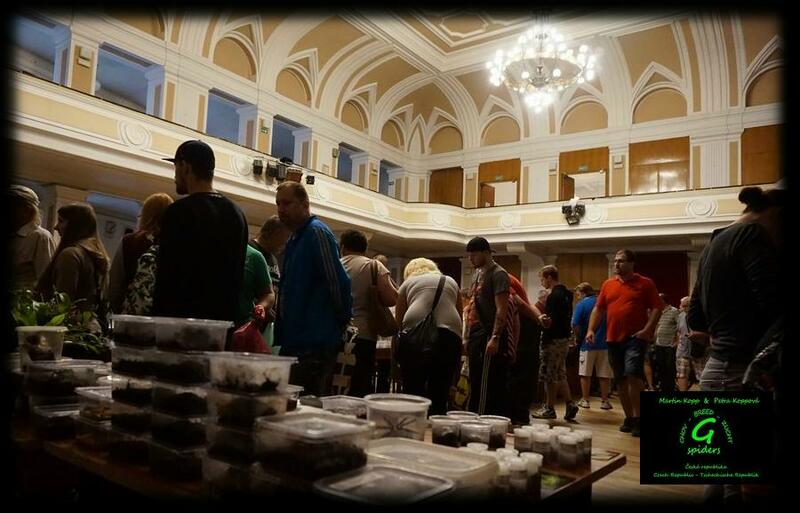 14.8.2014 We have new breeding: Brachypelma albopilosum. Our female opened her eggsack and seted her offspring free 28.7.2014 (L2). Moulting to 1. moult: 4.8.2014. The half of the offspring are traveling to male´s owner and we thank him for borrowing and for cooperation. 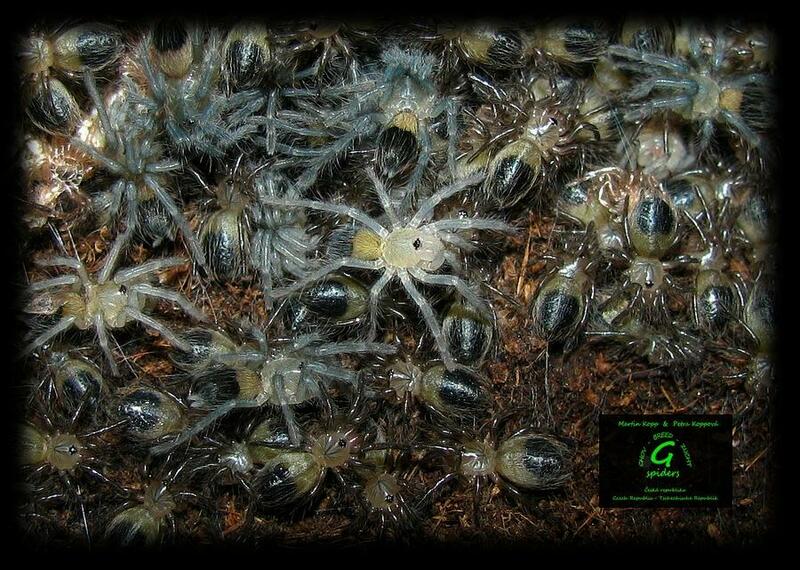 We offer spiderlings for sale: 1. moult - 1 €; 3x 1. moult - 2 €. Photo here: Brachypelma albopilosum (mláďata ve stádiu L2 na kokonu - spiderlings L2 on the eggsack). 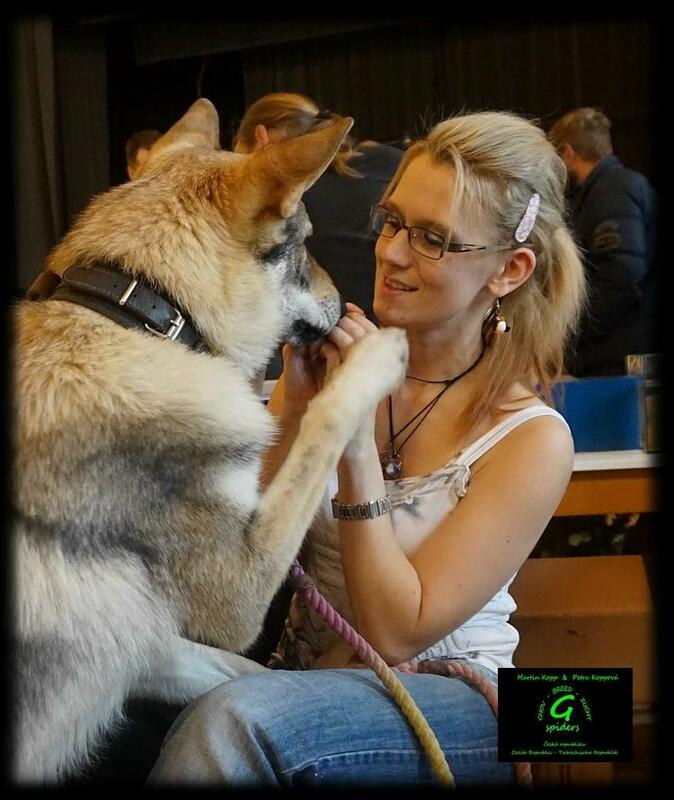 13.8.2014 2.8.2014 our female Yamia sp. Tam Dao opened her eggsack and seted her offspring free. These nice young have around 0,5 cm (span of legs) and we offer them for 1,5 €. Photo here: Yamia sp. Tam Dao (samice s kokonem - female with eggsack), Yamia sp. Tam Dao (1. svlek - 1. molt). We have new breeding: Leiurus quinquestriatus. We offer these offspring in 1. molt for 5 €. Attention! 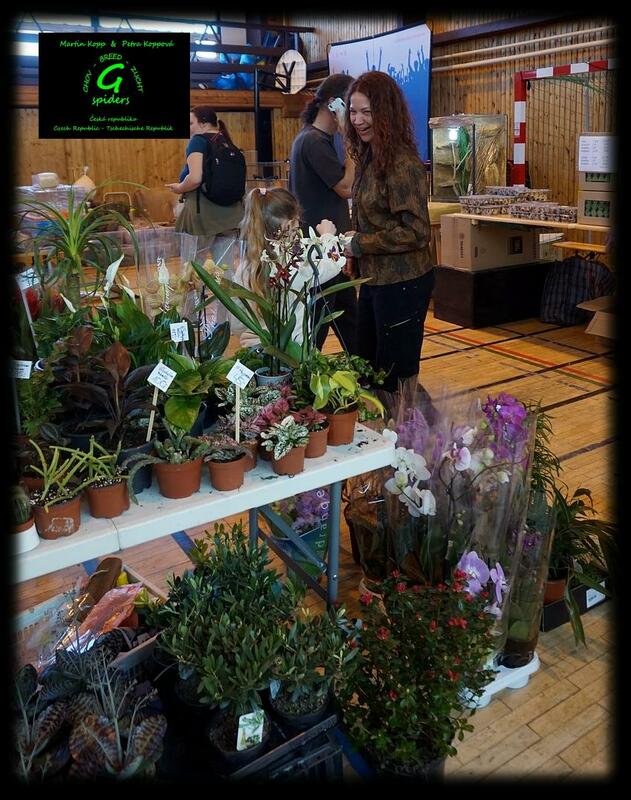 Only for experienced breeders - highly toxic species! We have offspring from import female. 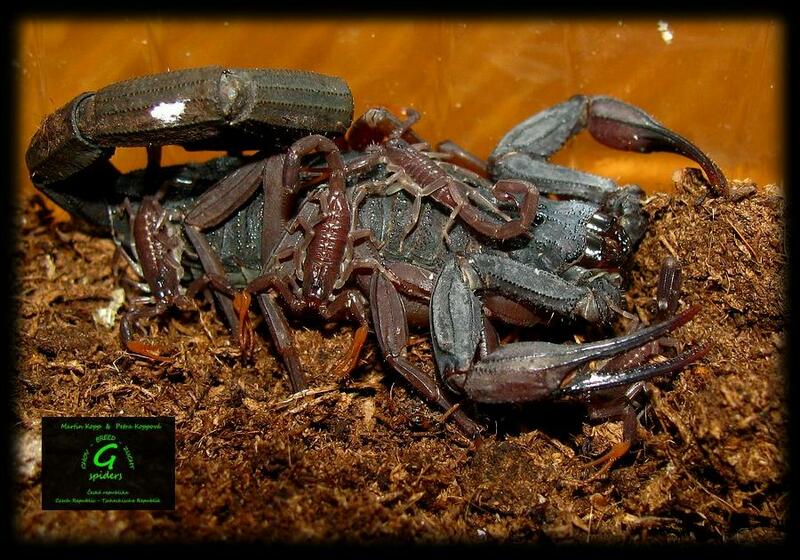 These scorpions are suitable for next breeding. Quantity discount: 8x - 33 €, exchange for other species after agreement. 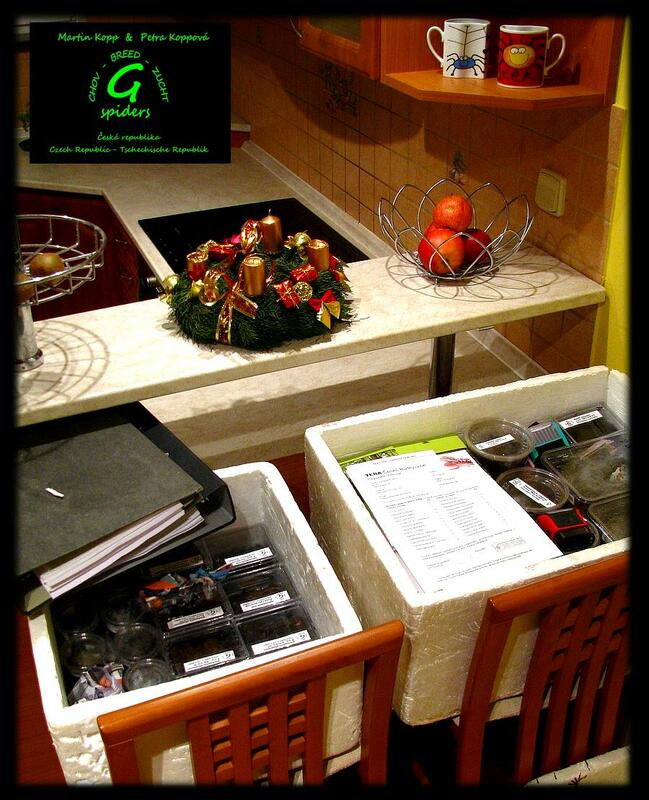 Kontakt: info on the website g-spiders.cz or by facebook G-Spiders. Photo here: Leiurus quinquestriatus (samice s mláďaty - female with offspring). Today we managed to take a picture of a female Brachypelma vagans with her eggsack. She has taken care of it already one week. Photo here: Brachypelma vagans (samice s kokonem - female with eggsack). The Unknown was Lasiodora fracta. 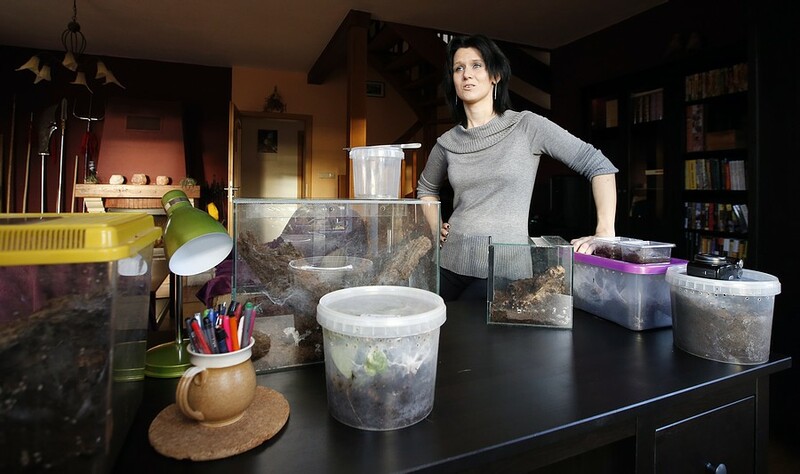 Aphonopelma anax in 1. molt won: Nela Dvořáková, Jan Kunce a Jan Dvořák. We got right answers from these participants: Bronislav Dvořák, Nela Dvořáková, Jan Melichar, Milan Kilián, Jan Kunce and Jan Dvořák. 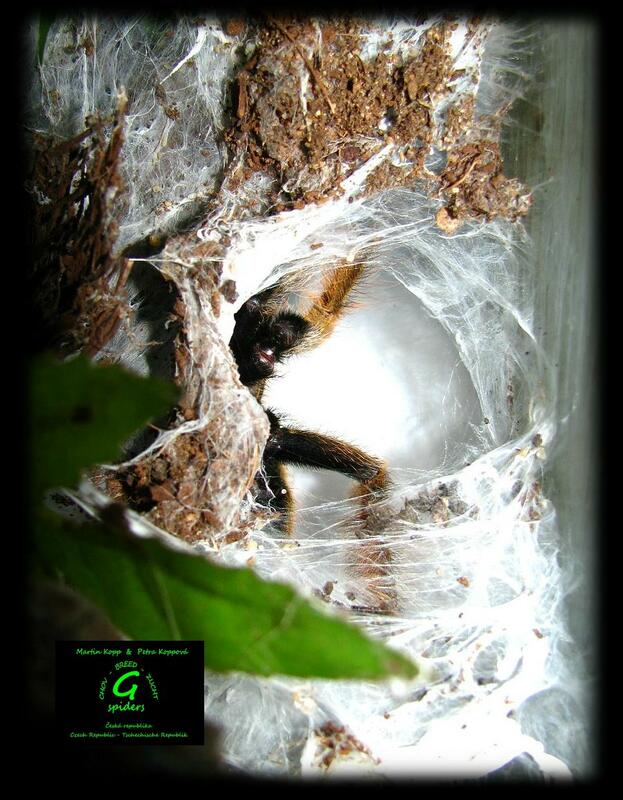 20.7.2014 New in our offer: Heterometrus petersi (NZ G-SPIDERS 6/2014, 1. molt 7/2014) We offer these offspring in 1. molt for 3 €. Photo of the breeding here: Heterometrus petersi samice s mláďaty (1. svlek) - female with offspring (1. molt)), Heterometrus petersi (1. svlek - 1. molt). This species is undemanding and suitable for beginning breeders too. 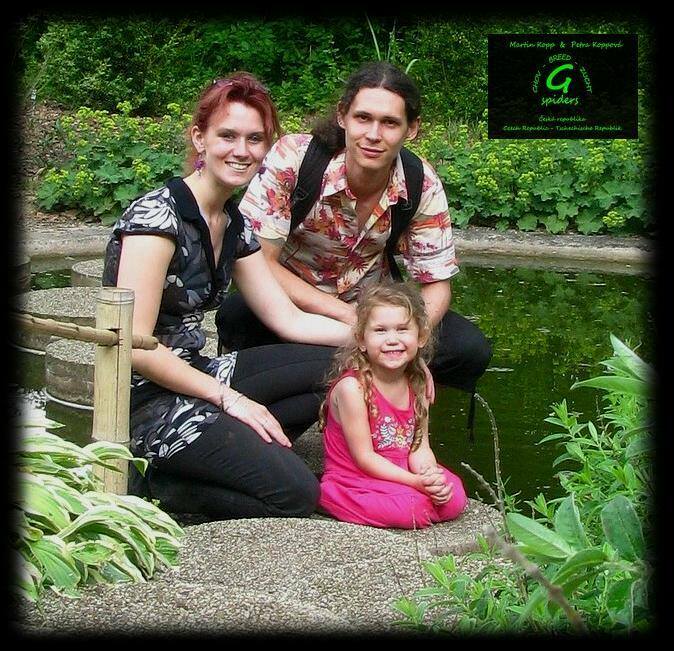 We have offspring from two females (both import) - we can offer young unrelated by blood. 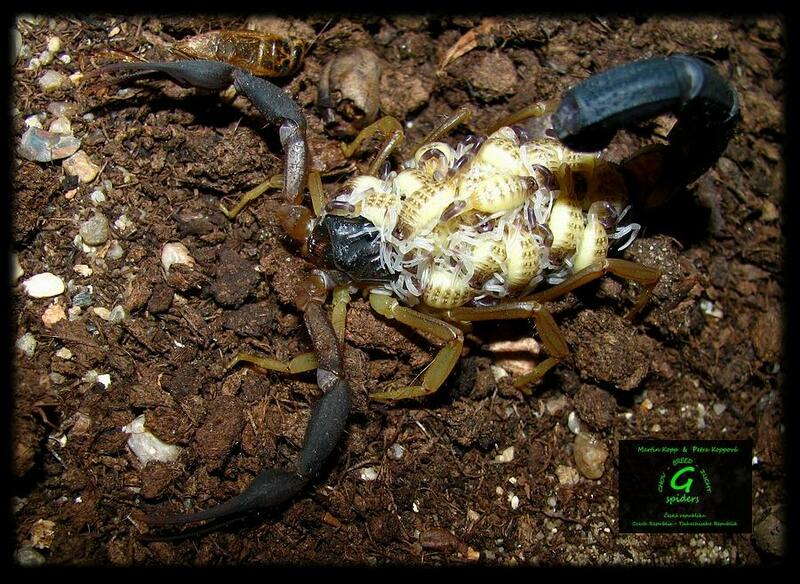 These scorpions are suitable for next breeding. Quantity discount: 6x - 15 €, exchange for other species after agreement. 19.7.2014 New in our offer: Aphonopelma anax 1. molt 4 €. (NZ G-SPIDERS 06/2014) Photo here: Aphonopelma anax. We have new breeding: Androctonus australis. We offer these offspring in 1. molt for 5 €. Photo here: Androctonus australis samice s mláďaty (1. svlek) - female with offspring (1. molt)). Attention! Only for experienced breeders - highly toxic species! We have offspring from two females (both import) - we can offer young unrelated by blood. 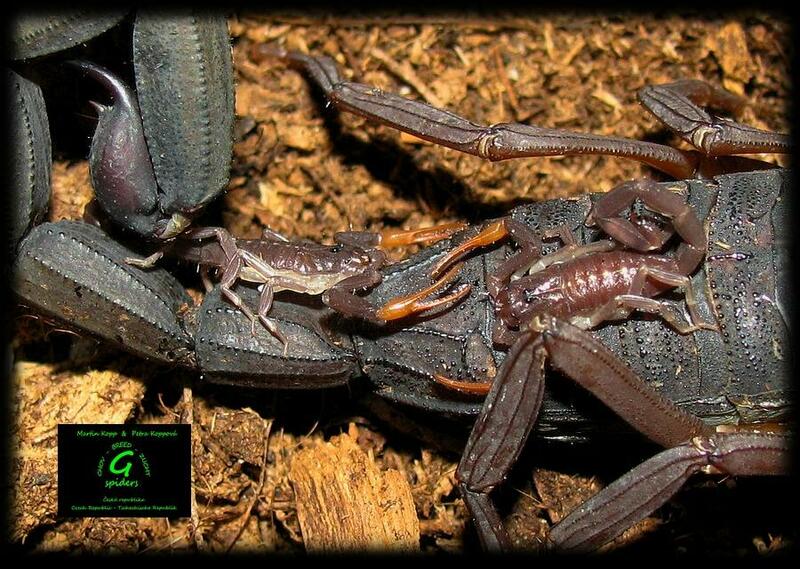 These scorpions are suitable for next breeding. Quantity discount: 8x - 33 €, exchange for other species after agreement. We added new species: Butheolus gallagheri, Hottentotta salei, Chaerilus solegladi, Leiurus sp. jižní Omán, Orthochirus glabifrons, Tityus clathratus, Uroplectes otimbinguensis. We currently have 105 species of scorpions in the Gallery. 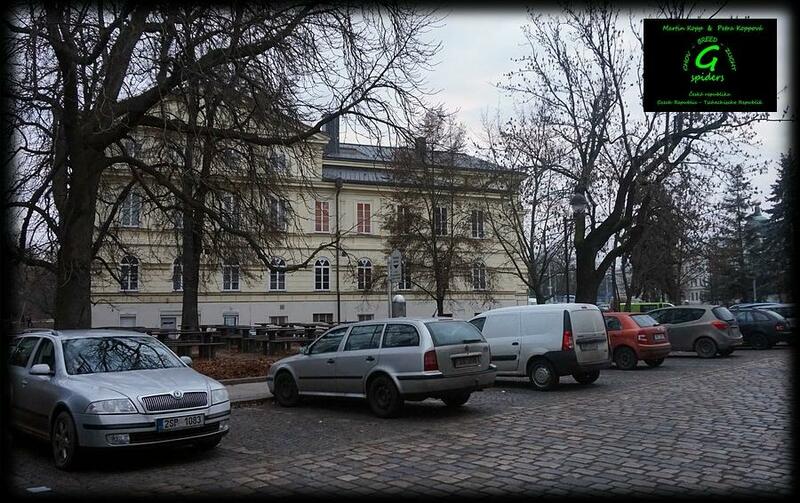 4.7.2014 Wau! We expected so our Event will be be in favour, but we did not expected so big turnout! We got nearly hundred messages with answers. The Unknown was Cyriocosmus chicoi. Brachypelma emilia in 3. molt won: Milan Kilián, Jan Simperk a Luboš Purchart. We got right answers from these participants: Jarolsav Pirožek, Michal Kovář, Jan Simperk, Jiří Šupálek, Luboš Purchart, Martin Špidla, Honza Lorenc, Zbyněk Kolář, David Dvořák, Nela Dvořáková, Jan Dvořák, Oldřich Kyjovský, Milan Kilián, Jana Tesařová, David Kuder, Antonín Polách, Bangee, Josef Carvan, Jaroslav Voborný, Štěpán Salaba a Jan Kunce. 28.6.2014 We added this new species: Brachypelma baumgarteni, Brachypelma kahlenbergi, Diplura sp. Rurrenabaque, Harpactira marksi. We currently have 302 species of tarantulas in the Gallery. Today we managed to take a picture of a female Brachypelma albopilosum with her eggsack. Photo here: Brachypelma albopilosum (samice s kokonem - female with eggsack). 15.6.2014 Our female of Heterometrus petersi gave birth to many beautiful offspring on Friday 13.6.2014. Juveniles will be released for sale in 1. molt for 3 €. We accept advance bookings now. Photo of the offspring here: Heterometrus petersi (samice s mláďaty (larvy) - female with offspring (nymphs)). Offspring of Opisthacanthus asper successfully molted to 1. molt. Photo of the offspring here: Opisthacanthus asper (samice s mláďaty (1. svlek) - female with offspring (1. molt)). New in our offer: 1.0 Grammostola alticeps (adult: 3.5.2014) Photo of the male here: Grammostola alticeps (dospělý samec - adult male). 9.6.2014 After two years, it returned your favorites knowledge competitions with prizes! Info here. 25.5.2014 New in our offer: POECILOTHERIA REGALIS 1. MOLT - 8 €. Rare. Not only female but also unrelated male, was originally from India. 30.4.2014 the female opened her eggsack. 15.5.2014 molting to 1. molt. Photo here: Poecilotheria regalis (1. svlek - 1. molt). 18.5.2014 New in our offer: 1.0 Aphonopelma iodius (adult: 10.5.2014) Photo of the male here: Aphonopelma iodius (dospělý samec - adult male). New in our offer: 1.0 Acanthoscurria atrox (adult: 16.5.2014) Photo of the male here: Acanthoscurria atrox (dospělý samec - adult male). New in our offer: 1.0 Xenesthis intermedia (adult: 17.5.2014) Photo of the male here: Xenesthis intermedia (dospělý samec - adult male). 30.4.2014 The long awaited spiderlings of Poecilotheria regalis are here! Young female, originally from nature, carried her first eggsack. These spiderlings will be of great benefit to breeding. Not only female but also unrelated male, was originally from India. Photo here: Poecilotheria regalis (samice s mláďaty ve stádiu L2 - female with spiderlings L2), Poecilotheria regalis (mládě ve stadiu L2 - spiderling L2). 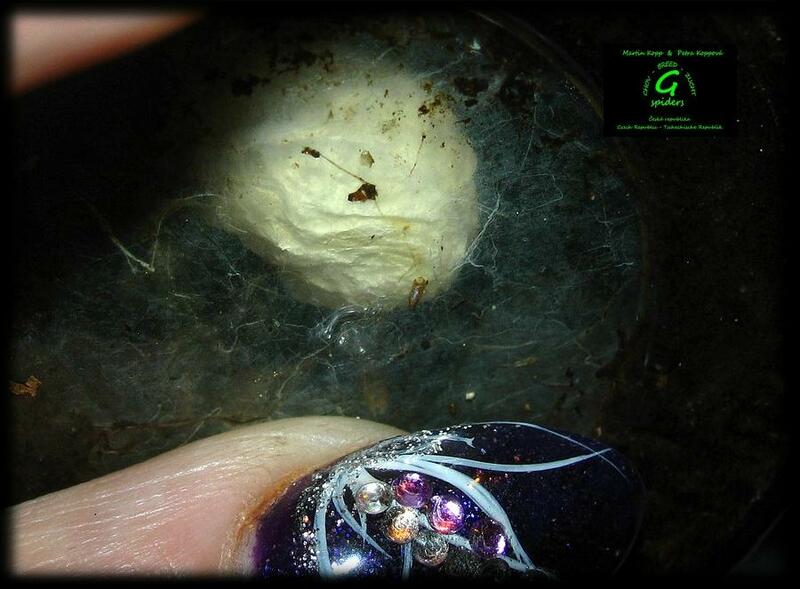 26.4.2014 Today we managed to take a picture of a female Brachypelma sabulosum with her eggsack. Photo here: Brachypelma sabulosum (samice s kokonem - female with eggsack). 25.4.2014 We have a new eggsack! This once our female Brachypelma sabulosum made us happy. 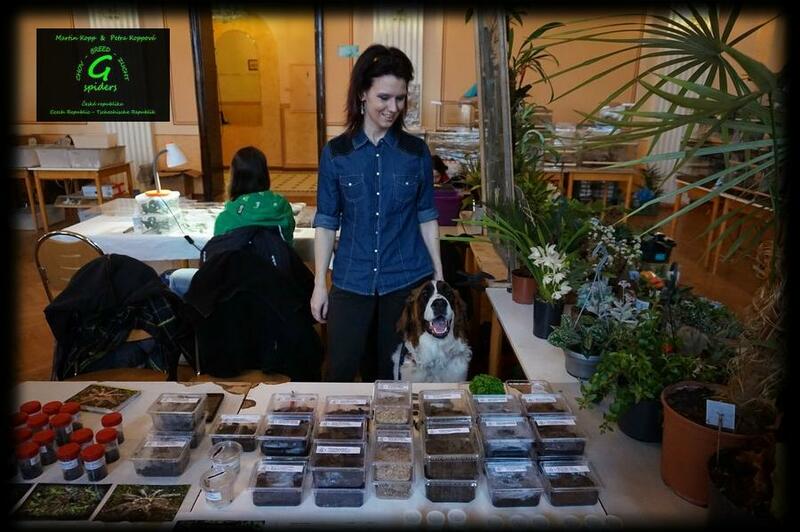 19.4.2014 We have new photos of following species: Acanthoscurria antillensis (4. svlek - 4. molt), Acanthoscurria geniculata (5. svlek - 5. molt), Androctonus australis (5. svlek - 5. molt), (dospělý samec - adult male), Androctonus bicolor (5. svlek - 5. molt), Aphonopelma sp. Azuero (10. svlek - 10. molt), Avicularia diversipes (samice - female), Avicularia hirschi (2. svlek - 2. molt), Avicularia laeta (7. svlek - 7. molt), Brachypelma albopilosum (9. svlek - 9. molt), (páření - mating), Brachypelma annitha (2. svlek - 2. molt), Brachypelma emilia (dospělá samice - adult female), (dospělý samec - adult male), Brachypelma sabulosum (páření - mating), Cyriocosmus bertae (5. svlek - 5. molt), Gorgyrella inermis (dospělá samice - adult female), Grammostola mollicoma (8. svlek - 8. molt), Grammostola rosea RCF (8. svlek - 8. molt), Grammostola rosea (dospělý samec - adult male), Haplopelma lividum (4. svlek - 4. molt), Heterometrus petersi (dospělý samec - adult male), Holothele sp. Isla Margarita (6. svlek - 6. molt), Chilobrachys andersoni (samice s kokonem - female with eggsack), (samice s mláďaty ve stádiu L2 a 1. svleku - female with spiderlings L2 and 1. molt), (svlékání z L2 do 1. svleku - molting from L2 to 1. molt), Chromatopelma cyaneopubescens (3. svlek - 3. molt), Monocentropus balfouri (6. svlek - 6. molt), Nhandu coloratovillosus (8. svlek - 8. molt), Pelinobius muticus (4. svlek - 4. molt), Poecilotheria rufilata (4. svlek - 4. molt), Poecilotheria metallica (dospělá samice - adult female), (dospělý samec - adult male), Psalmopoeus irminia (3. svlek - 3. molt), Selenocosmia arndsti (7. svlek - 7. molt), Selenocosmia crassipes (11. svlek - 11. molt), Sericopelma melanotarsum (dospělý samec - adult male), (páření - mating). 12.4.2014 The mating Aphonopelma anax was successful. :-) Since 7.4.2014 our female has cared about nice big eggsack. Photo here: Aphonopelma anax (samice s kokonem - female with eggsack). 29.3.2014 All tots Grosphus grandidieri are in 1. molt. Photo here: Grosphus grandidieri (samice s mláďaty (1. svlek) - female with offspring (1. molt)). 24.3.2014 Our female Grosphus grandidieri gave bith in evening 22.3.2014. They are nice. :-) Photo here: Grosphus grandidieri. 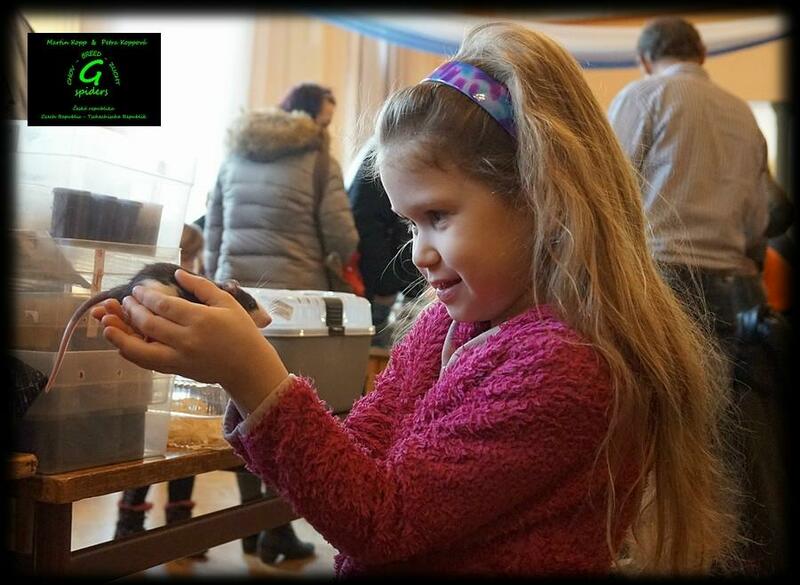 12.3.2014 We added an introduction and new informations into our articel about Breeding Chilobrachys andersoni. We do apologize, but our articles are only in czech language provisionally. 4.3.2014 We have only the best news today. Our female Chilobrachys andersoni let her spiderlings out of her eggsack exactly at the time when they are molting from L2 to 1. molt. In addition to our multiple ´Anderson Mom´ also made us happy female Poecilotheria regalis. 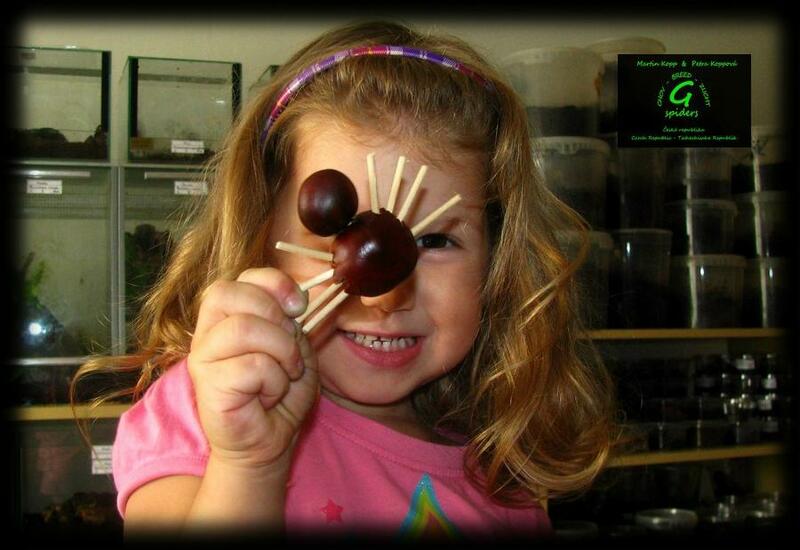 Young female, originally from nature, built her first eggsack. These spiderlings would be of great benefit to breeding. Not only female but also unrelated male, was originally from India. 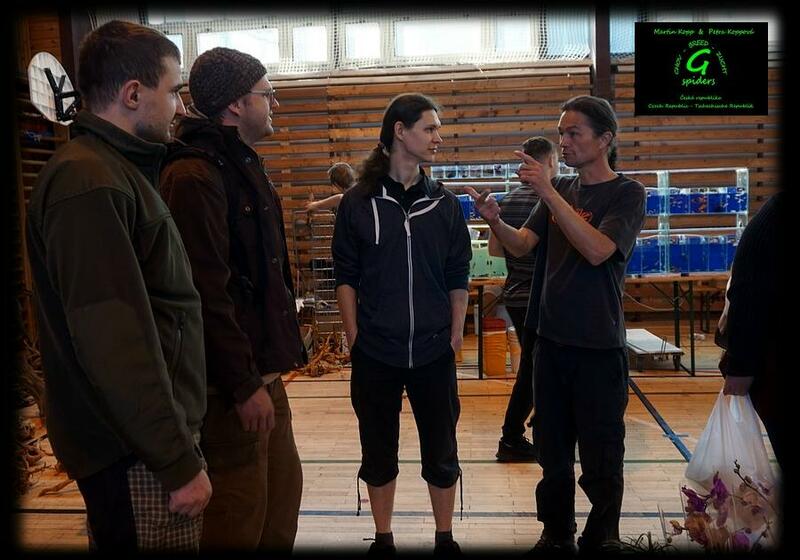 12.1.2014 The first news of 2014 ... We have good news and bad news. Unfortunately the female Sericopelma melanotarsum destroyed her eggsack (due to stress induced by ambient noise)... A first good news this year: successful breeding Poecilotheria ornata. Spiderlings are in 1. molt and they are really good hunters. We offer them for 6 €. 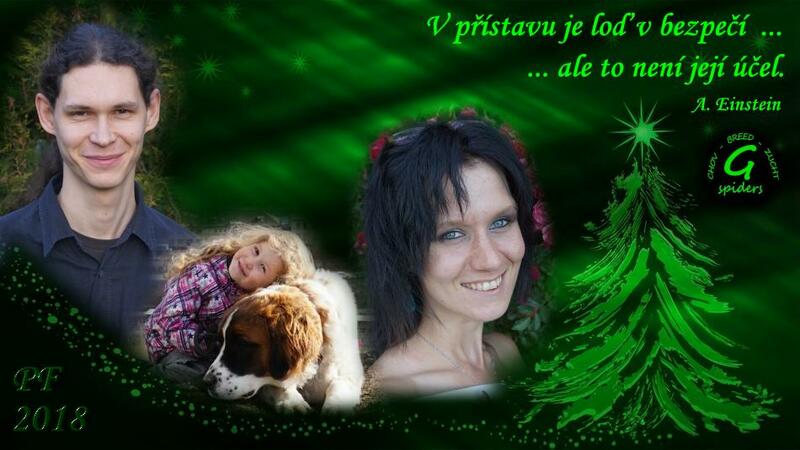 24.12.2013 Dear friends... we wish you marry christmas and peace, love, health and all the best to new year 2014! 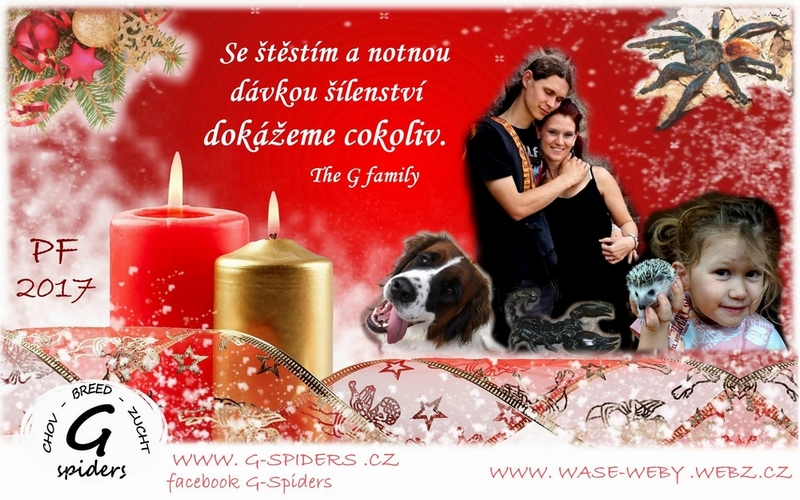 We thank you for your favour and for your likes for our presentation on facebook G-Spiders. Also we thank you for cooperation with us and we look forward to next time. 23.12.2013 We added this new species: Avicularia hirschi, Cyriopagopus sp. Hati Hati, Neochilobrachys sp. Khao Chong, Theraphosidae sp. Borneo Sepilok. We currently have 298 species of tarantulas in the Gallery. We added new specie: Lychas scutilus. We currently have 95 species of scorpions in the Gallery. We have new photos of following species: Aphonopelma anax (dospělý samec - adult male), Avicularia laeta (7. svlek - 7. molt), Grammostola pulchripes (6. svlek - 6. molt), Haplopelma lividum (2. svlek - 2. molt), Heterothele villosella (samice s kokonem - female with eggsack), Holothele sp. Isla Margarita (4. svlek - 4. molt), Chromatopelma cyaneopubescens (2. svlek - 2. molt), Iridopelma hirsutum (3. svlek - 3. molt), Nhandu coloratovillosus (7. svlek - 7. molt), Opisthacanthus rugiceps (samice s mláďaty (larvy) - female with offspring (nymphs)), Paroedura picta (dospělý samec - adult male), Phlogiellus sp. Palawan (dospělý samec - adult male), Poecilotheria miranda (4. svlek - 4. molt), Poecilotheria ornata (mláďata ve stádiu L2 po vypuštění z kokonu - nymphs L2 around female after leaving their eggsack), Poecilotheria smithi (5. svlek - 5. molt), Poecilotheria striata (5. svlek - 5. molt), Psalmopoeus pulcher (1. svlek - 1. molt), Rhopalurus garridoi (páření - mating), Selenocosmia sp. Titiwanga (dospělá samice - adult female), Schismatothele cf. iridescens (6. svlek - 6. molt), Theraphosa apophysis (5. svlek - 5. molt), Theraphosidae sp. II (dospělá samice - adult female). 20.12.2013 Mating of Heterothele villosela was successful and our female hold a nice eggsack. Also our female Poecilotheria ornata made us happy, she let from eggsack many spiderling. 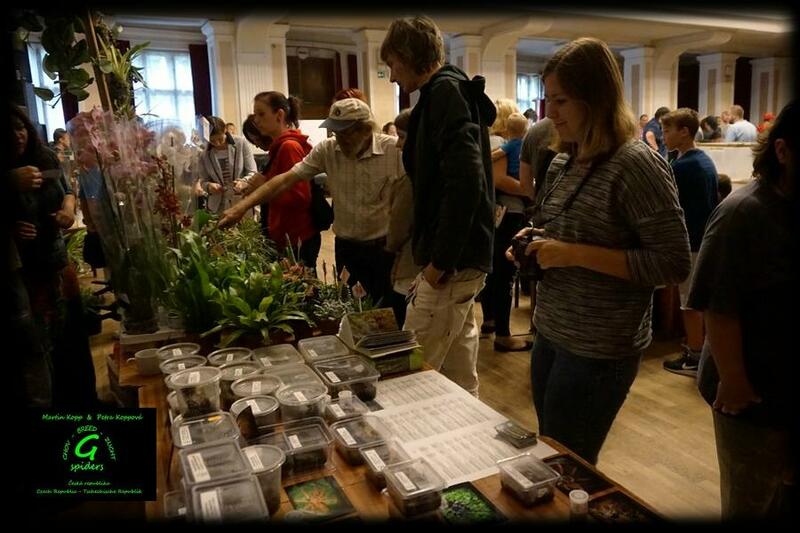 7.12.2013 We added this new specie: Haplocosmia himalayana. We currently have 294 species of tarantulas in the Gallery. We have newborns Tityus ecuadorensis! 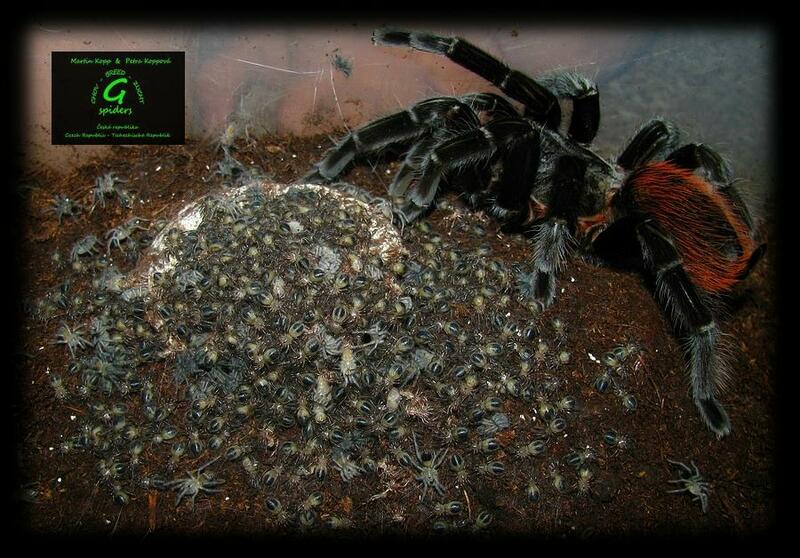 Our female had nice youngs in the end of November, they molted to first molt 4.12.2013. Part of youngs were offered for sale. We have new photos of following species: Lychas mucronatus (samice - female), Monocentropus balfouri (2. svlek - 2. molt), Ornithoctonus aureotibialis (2. svlek - 2. molt), Pandinus imperator (samice s mláďaty (larvy) - female with offspring (nymphs)), Pandinus sp. Uganda (páření - mating), Plesiophrictus raja (6. svlek - 6. molt), Psalmopoeus irminia (spermatheca). 24.11.2013 We have newborns Opisthacanthus rugiceps! Our female had nice youngs in the first half of November, they molted to first molt 23.11.2013. Part of youngs were offered for sale. We offer new adult males: Brachypelma angustum, Heterothele villosella, Phlogiellus sp. Palawan,... Details in: PRICELIST. 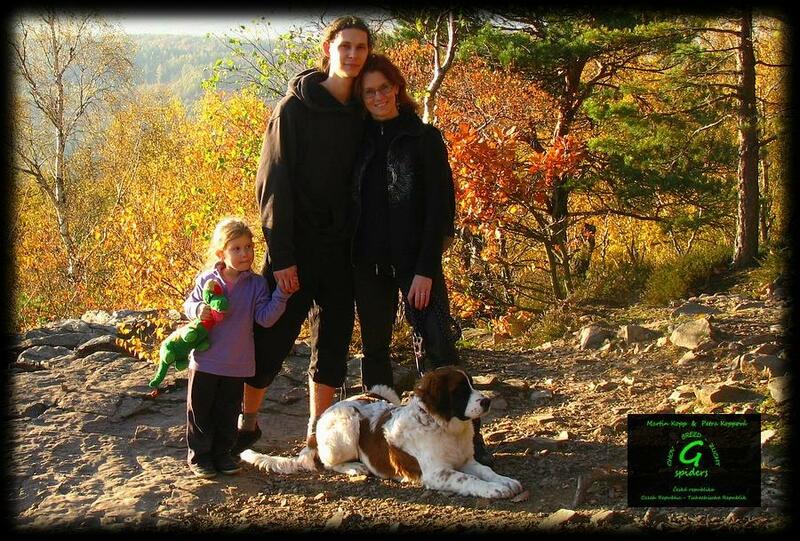 20.11.2013 We added this new specie: Chilobrachys sp. blue. We currently have 293 species of tarantulas in the Gallery. 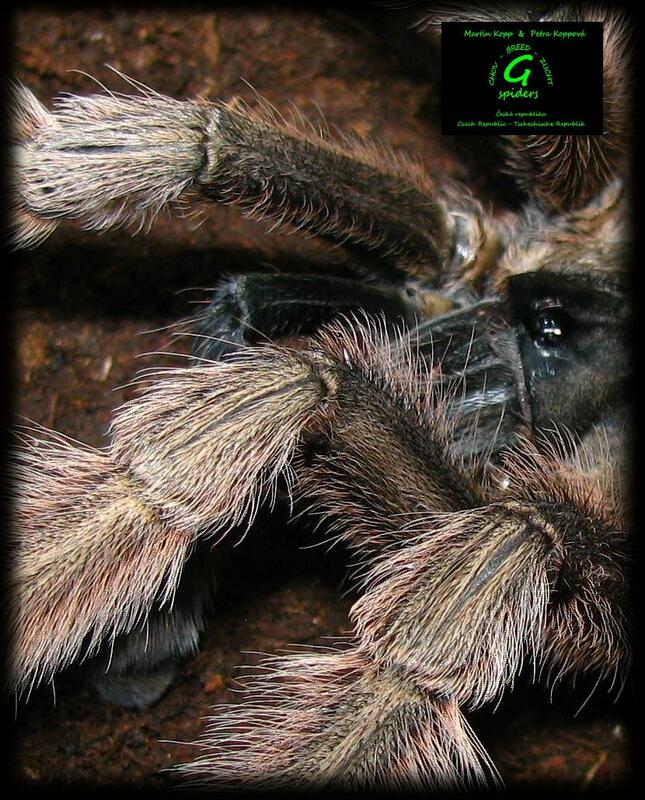 We have new photos of following species: Aphonopelma sp. Azuero (8. svlek - 8. molt), Brachypelma angustum (dospělý samec - adult male), Centruroides nigrescens (dospělý samec a dospělá samice - adult male and adult female), Cyriocosmus chicoi (dospělá samice (10. svlek) - adult female (10. molt)), Fufius sp. (1,5 cm v těle - 1,5 cm body-size), Heterothele villosella (dospělá samice - adult female), (dospělý samec - adult male), (námluvy - before mating), (páření - mating), Kochiana brunnipes (7. svlek - 7. molt), Phlogiellus sp. Palawan (dospělá samice - adult female), (dospělý samec - adult male). 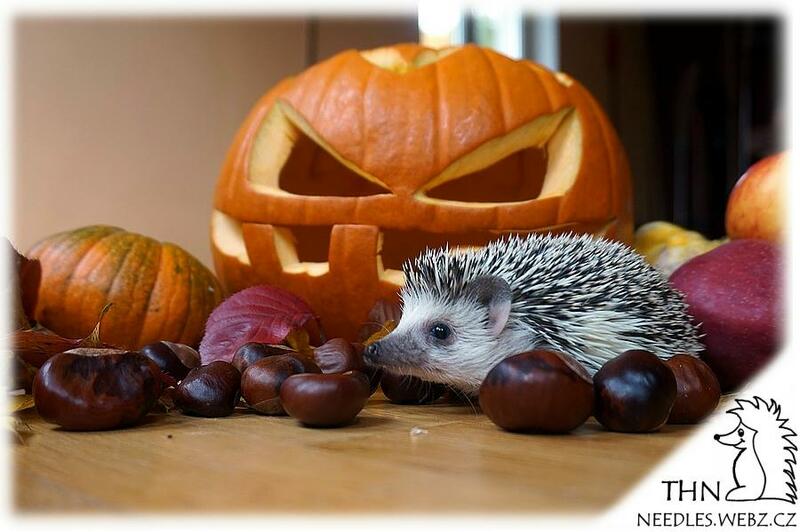 27.10.2013 We have new photos of following species: Brachypelma albopilosum (spermatheca), Brachypelma smithi (5. svlek - 5. molt), Cyclosternum sp. Cundinamarca (dospělá samice - adult female), Hapalopus cf. formosus (dospělá samice 15. svlek - adult female 15. molt), Pelinobius muticus (2. svlek - 2. molt), Selenocosmia crassipes (9. svlek - 9. molt), Vitalius paraensis (13. svlek - 13. molt). 9.9.2013 We added this new specie: Yamia sp. Tam Dao. We currently have 292 species of tarantulas in the Gallery. We added new species: Centruroides nigrescens, Euscorpius sp., Hoffmannius punctatus, Rhopalurus princeps, Tityus trinitatis, Vaejovis occidentalis. We currently have 93 species of scorpions in the Gallery. We have new photos of following species: Agnostopelma gardel (3. svlek - 3. molt), Aphonopelma seemanni (dospělá samice 16. svlek - adult female 16. molt), (spermatheca), Aphonopelma waconum (11. svlek - 11. molt), Grammostola rosea RCF (7. svlek - 7. molt), Idiothele mira (7. svlek - 7. molt), Poecilotheria miranda (4. svlek - 4. molt), Poecilotheria smithi (4. svlek - 4. molt), Rhopalurus garridoi (dospělá samice - adult female), (dospělý samec - adult male), Rhopalurus junceus (4. svlek - 4. molt), Selenocosmia arndsti (5. svlek - 5. molt), Sericopelma sp. Meg (8. svlek - 8. molt), Tityus serrulatus (samice - subadult female), Tityus trivittatus (samice - subadult female), Tityus zulianus (2. svlek - 2. molt), Vitalius paraensis (12. svlek - 12. molt), Yamia sp. Namtok Phlio (dospělá samice - adult female). 3.9.2013 We have new photos of following species: Haplopelma schmidti (páření - mating), Hottentotta jayakari (4. svlek - 4. molt), Idiothele mira (6. svlek - 6. molt), Kochiana brunnipes (dospělý samec - adult male), Lasiodora parahybana (4. svlek - 4. molt), Nhandu coloratovillosus (páření - mating), Phormictopus auratus (dospělá samice 11. svlek - adult female 11. molt), Plesiopelma sp. Bolivie (dospělá samice 10. svlek - adult female 10. molt), (dospělý samec - adult male), Poecilotheria bara (2. svlek - 2. molt), Poecilotheria smithi (3. svlek - 3. molt), Selenocosmia crassipes (9. svlek - 9. molt), Sericopelma melanotarsum (dospělý samec - adult male), (páření - mating), Yamia sp. Namtok Phlio (dospělý samec - adult male). 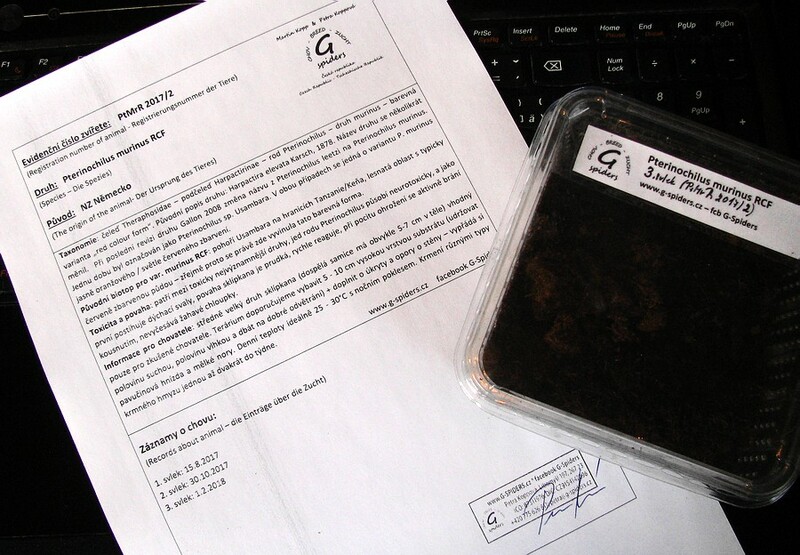 25.7.2013 We added this new specie: Brachypelma sabulosum. We currently have 291 species of tarantulas in the Gallery. We added new species: Alloscorpiops sp. Malaysie, Rhopalurus junceus, Tityus trivittatus. We currently have 87 species of scorpions in the Gallery. We added this new specie: Stegodyphus lineatus, We currently have 33 species of Labidognatha in the Gallery. 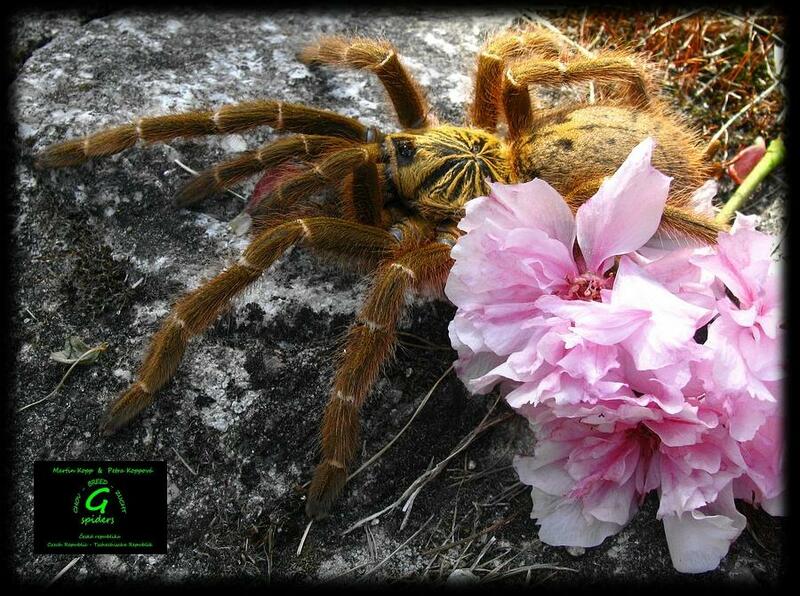 4.4.2013 We have new photos of following species: Acanthoscurria atrox (14. svlek - 14. molt), Aphonopelma sp. Azuero (7. svlek - 7. molt), Avicularia versicolor (4. svlek - 4. molt), Grammostola rosea (dospělá samice - adult female), Hysterocrates gigas (páření - mating), Phormictopus cancerides cancerides (páření - mating), Poecilotheria formosa (dospělá samec - adult male). 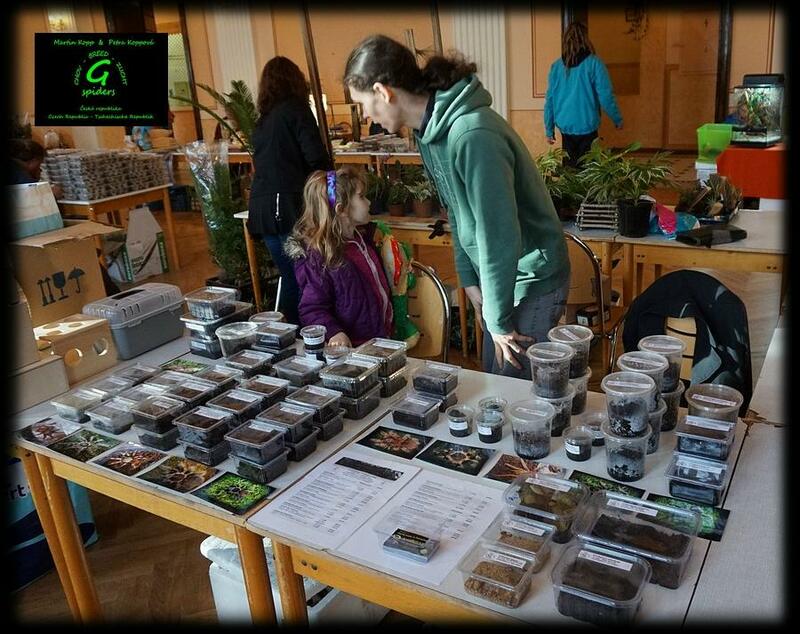 17.3.2013 We offer new tarantulas, see: PRICELIST. 22.1.2013 We added this new Article: France - Spain (6.6.-12.6.2011). We added this new specie: Orphnaecus sp. Negros, We currently have 292 species of tarantulas in the Gallery. We added new species: Euscorpius italicus, Hottentotta conspersus, Mesobuthus caucasicus, Opisthacanthus darainensis. We currently have 84 species of scorpions in the Gallery. We have new photos of following species: Acanthoscurria natalensis (dospělý samec - adult male), Acanthoscurria sp. Chapare (spermatheca), Aphonopelma anax (11. svlek - 11. molt), Aphonopelma sp. Azuero (5. svlek - 5. molt), Avicularia metallica (2. svlek - 2. molt), Brachypelma annitha (2. svlek - 2. molt), (3. svlek - 3. molt), Brachypelma auratum (4. svlek - 4. molt), Cyclosternum schmardae (dospělá samice 13. svlek - adult female 13. molt), Euathlus pulcherrimaklaasi (dospělá samice 12. svlek - adult female 12. molt), Grammostola pulchripes (3. svlek - 3. molt), Grosphus grandidieri (dospělá samice - adult female), Grosphus flavopiceus (dospělá samice - adult female), (samice s mláďaty (larvy) - female with offspring (nymphs)), Hapalopus cf. formosus (spermatheca), Haplopelma minax (5 cm v těle - 5 cm body-size), Hottentotta sp. Uganda (samice s mláďaty (1. svlek) - female with offspring (1. molt)), Chaerilius sp. Kuala Lipis (dospělá samice - adult female), (dospělá samice a dospělý samec - adult female and adult male), Chilobrachys sp. Sai Yok (8. svlek - 8. molt), Linothele megatheloides (terárium (obydlí) rodu linothele - terarium of linothele), Opisthacanthus rugiceps (1. svlek - 1. molt), Ornithoctonus sp. Malthai (dospělá samice - adult female), Orphnaecus sp. (dospělá samice - adult female), Pandinus sp. Uganda (samice s mláďaty (larvy) - female with offspring (nymphs)), (mládě ve stádiu larvy - nymph), Poecilotheria bara (mládě ve stádiu L2 - spiderling L2), Poecilotheria regalis (spermatheca), Ptychozoon kuhli (dospělá samice a dospělý samec - adult female and adult male), Theraphosa apophysis (mládě ve stádiu L2 (krátce před svlekem, již patrné světlé znaky na nohou) - spiderling L2), Tityus ecuadorensis (dospělý samec - adult male), Tityus proseni (mládě - young), Tityus stigmurus (dospělé samice - adult females), Tityus zulianus (samice s mláďaty (1. svlek) - female with offspring (1. molt)). 6.12.2012 We added new species: Orthochirus scrobiculosus, Tityus proseni. We currently have 80 species of scorpions in the Gallery. 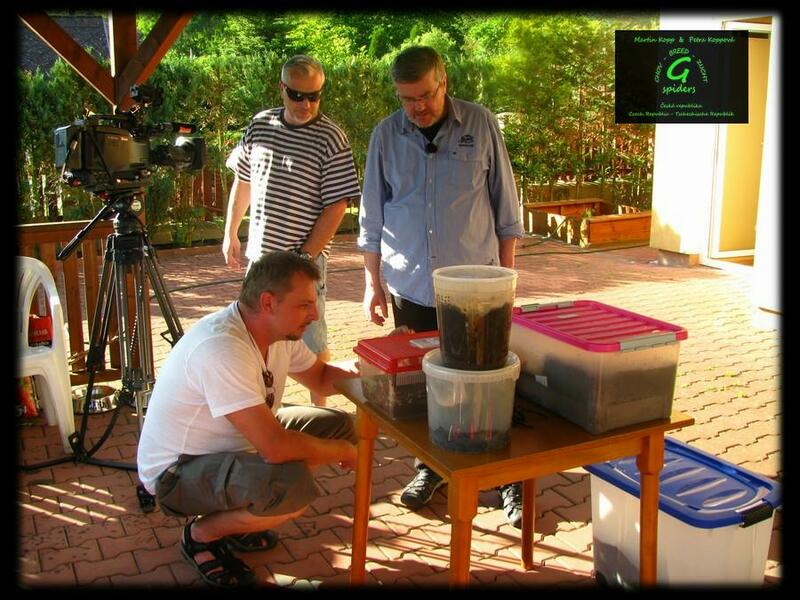 30.11.2012 We added new species: Centruroides guanensis. We currently have 78 species of scorpions in the Gallery. We have new photos of following species: Parabuthus transvaalicus (1. svlek - 1. molt). 11.11.2012 We added this new specie: Avicularia sp. Rurrenabaque, Poecilotheria smithi. We currently have 291 species of tarantulas in the Gallery. We have new photos of following species: Avicularia versicolor (3. svlek - 3. molt), (4. svlek - 4. molt), Ephebopus cyanognathus (2. svlek - 2. molt), Heterometrus laoticus (samice s mládětem (larva) - female with young (nymph)), Poecilotheria miranda (1. svlek - 1. molt). 2.11.2012 We added this new specie: Hysterocrates cf. latipes. We currently have 289 species of tarantulas in the Gallery. We have new photos of following species: Androctonus australis (2. svlek - 2. molt), Androctonus bicolor (5. svlek - 5. molt), Cyclosternum cundinamarca (5. svlek - 5. molt), Cyclosternum sp. Kolumbie (4. svlek - 4. molt), Hapalopus cf. formosus (samice s kokonem - female with eggsack), (mláďata v 1. svleku u samice - youngs in 1. molt around female), Haplopelma hainanum (dospělý samec - adult male), Haplopelma schmidti (samice s kokonem - female with eggsack), Hottentotta gentili (1. svlek - 1. molt), Hottentotta tamulus-syndicus (2. svlek - 2. molt), Opisthacanthus asper (5. svlek - 5. molt), Poecilotheria pederseni (4. svlek - 4. molt), Poecilotheria striata (1. svlek - 1. molt), Psalmopoeus reduncus (6. svlek - 6. molt), Rhopalurus garridoi (3. svlek - 3. molt), Theraphosidae sp. Panama (4. svlek - 4. molt), Thrixopelma pruriens (10. svlek - 10. molt), Tityus ecuadorensis (4. svlek - 4. molt), Xenesthis intermedia (10. svlek - 10. molt). 27.10.2012 We added this new specie: Schismatothele cf. iridescens. We currently have 288 species of tarantulas in the Gallery. We added new species: Pandinus sp. 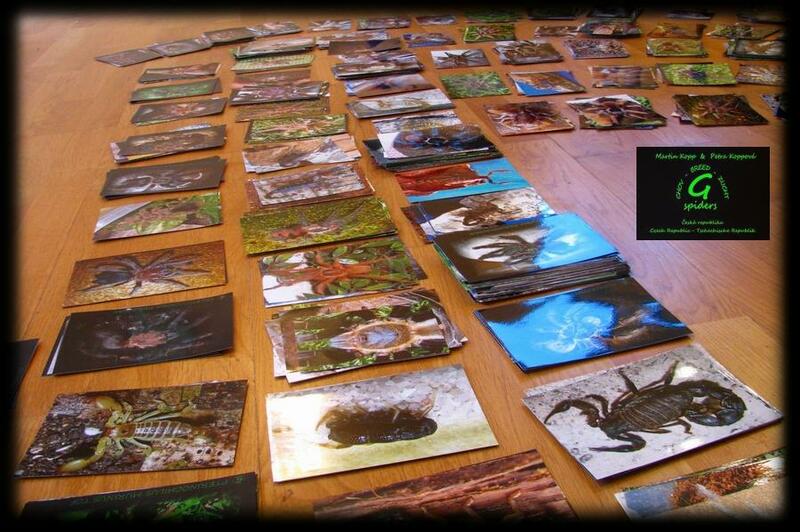 Uganda, We currently have 77 species of scorpions in the Gallery. We have new photos of following species: Acanthoscurria natalensis (dospělý samec - adult male), Androctonus australis (2. svlek - 2. molt), Fufius sp. (1,5 cm v těle - 1,5 cm body-size), Grosphus flavopiceus (5. svlek - 5. molt), Heterometrus mysorensis (2. svlek - 2. molt), Hottentotta jayakari (5. svlek - 5. molt), Hottentotta sp. Uganda (dospělá samice a dospělý samec - adult female and adult male), Chaetopelma gracile (4. svlek - 4. molt), Poecilotheria striata (samice s mláďaty v 1. svleku ve svém hnízdě - female with spiderlings (1. molt) in her lair), Rhopalurus garridoi (2. svlek - 2. molt), Stichoplastoris sp. Costa Rica (11. svlek - 11. molt), Theraphosa apophysis (3. svlek - 3. molt) Theraphosidae sp. III (samice 8. svlek - female 8. molt). 18.+19.10.2012 We added new species: Heterometrus mysorensis, Opisthacanthus rugiceps, Rhopalurus garridoi. We currently have 76 species of scorpions in the Gallery. We have new photos of following species: Acanthoscurria geniculata (6. svlek - 6. molt), Ami sp. Bolivie (dospělý samec - adult male), Brachypelma angustum (10. svlek - 10. molt), Brachypelma emilia (6. svlek - 6. molt), Ceratogyrus sanderi (dospělá samice 10. svlek - adult female 10. molt), Citharacanthus livingstoni (13. svlek - 13. molt), Grammostola alticeps (11. svlek - 11. molt), Hottentotta sp. Uganda (samice s mláďaty (larvy) - female with young (nymphs)), Chilobrachys andersoni (dospělá samice - adult female), Lasiodora fracta (14. svlek - 14. molt), Lasiodorides polycuspulatus (11. svlek - 11. molt), Pamphobeteus ultramarinus (samice 9. svlek - female 9. molt), Poecilotheria striata (dospělá samice 12. svlek - adult female 12. molt), (samice s kokonem ve svém hnízdě - female with eggsack in her lair), Sericopelma melanotarsum (5. svlek - 5. molt), Tapinauchenius latipes (dospělá samice - adult female), (dospělý samec - adult male), Tapinauchenius plumipes (dospělá samice 11. svlek - adult female 11. molt), Theraphosidae sp. Ecuador 17 (9. svlek - 9. molt). 8.10.2012 We have new photos of following species: Brachypelma smithi (3. svlek - 3. molt), Eucratoscelus pachypus (3. svlek - 3. molt), Mygalomorphae sp. Gordo (8. svlek - 8. molt), Pamphobeteus ultramarinus (samice 9. svlek - female 9. molt), Phormictopus cancerides cancerides (spermatheca), Poecilotheria fasciata (dospělá samice - adult female), Sericopelma sp. Azuero (6. svlek - 6. molt), Tapinauchenius latipes (dospělá samice - adult female), Theraphosidae sp. Panama (5. svlek - 5. molt). 2.9.2012 We added this new specie: Hottentotta sp. Uganda. We currently have 69 species of scorpions in the Gallery. 1.9.2012 We have new photos of following species: Cyclosternum schmardae (samice zakousla samce při páření - female killed male during mating), Eresus sp. Pelopones (dospělý samec - adult male), Phormictopus cancarides cancarides (dospělý samec - adult male), Theraphosidae sp. I (Costa Rica) (dospělý samec - adult male; páření - mating). 21.8.2012 We added this new specie: Eresus sp. Pelopones. We currently have 287 species of tarantulas in the Gallery. We have new photos of following species: Euathlus sp. Chile (orange) (spermatheca), Grosphus flavopiceus (dospělá samice - adult female), Haplopelma hainanum (8. svlek - 8. molt), Chilobrachys huahini (samice s mláďaty ve svém hnízdě - female with spiderlings in her lair; 1. svlek krátce po svlékání a L2 krátce před svlekem - 1. molt right after molting and L2 shortly before molting), Pamphobeteus nigricolor (dospělá samice 11. svlek - adult female 11. molt), Parabuthus liosoma (dospělý samec - adult male; páření - mating), Vitalius paraensis (10. svlek - 10. molt). 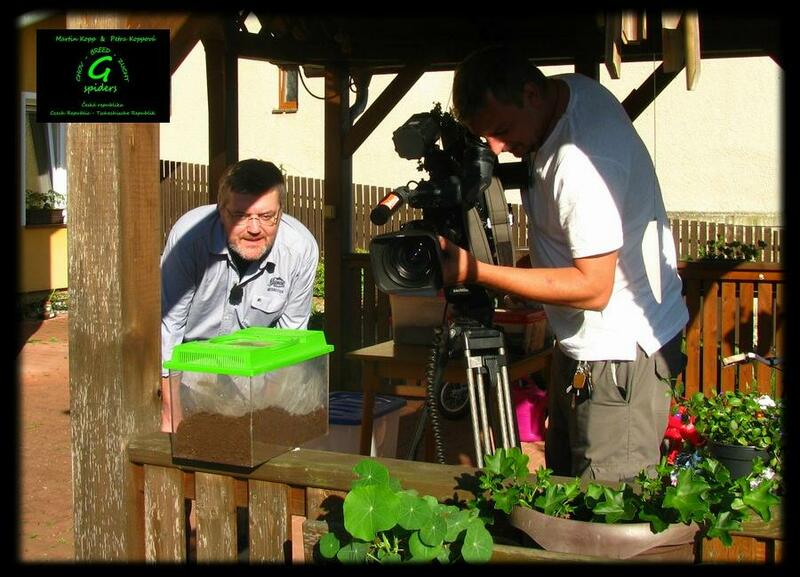 15.7.2012 We have new photos of following species: Avicularia laeta (samice s mláďaty v 1.sv. ), Eucratoscelus pachypus (2.sv. ), Chaerilius sp. Kuala Lipis (2.sv. ), Kochiana brunnipes (7.sv. ), Oligoxystre sp. Velvet Mountain (9.sv. ), Phormictopus auratus (mláďata ve stádiu L2 a 1.sv. ), Plesiophrictus raja (4.sv.) a Theraphosa apophysis (spermatheca). 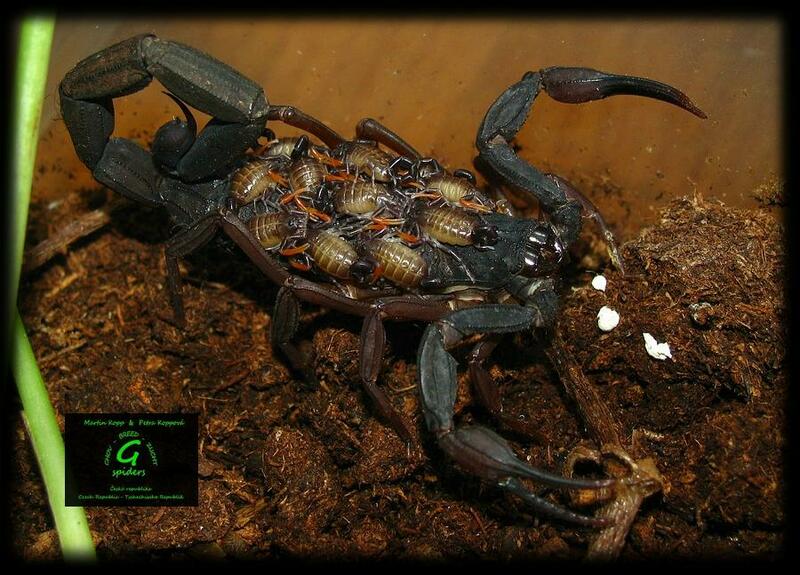 2.6.2012 We added a new article: Breeding Theraphosa apophysis. We published the winner and the correct solution to the competition in May. Only one contestant predicted correctly. Thanks for your attendance. We look forward to your reply in June. 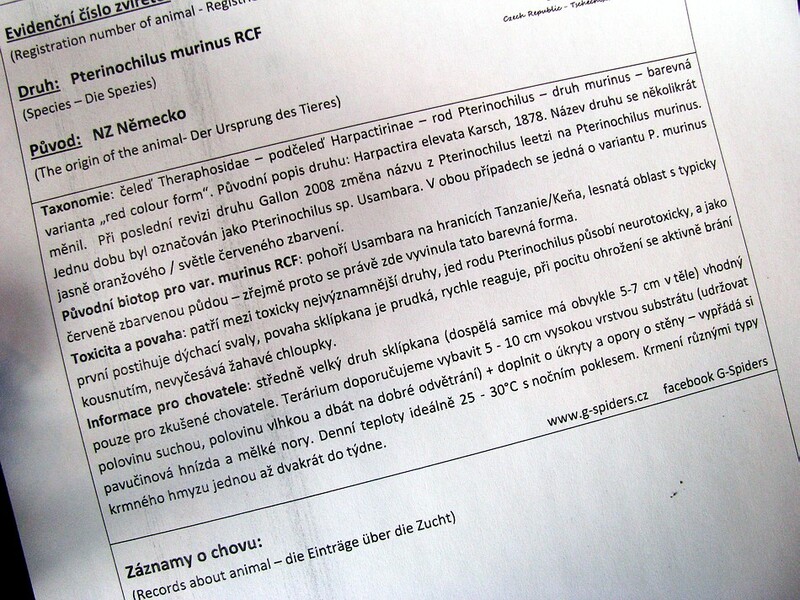 27.5.2012 We added a new article: Avicularia braunshauseni (základní informace o druhu, formát pdf). 1.5.2012 We have new photos of following species: Aphonopelma sp. Malinche (adultní samice, spermatheca), Brachypelma klaasi (6.sv., 12.sv. ), Heterometrus laoticus (adultní jedinci), Chilobrachys sp. Telung Bahang (adultní samice), Idiothele nigrofulva (spermatheca), Kochiana brunnipes (5.sv. ), Parabuthus liosoma (adultní jedinec), Poecilotheria striata (adultní samec), Psalmopoeus reduncus (4.sv.) a Theraphosa apophysis (1.sv., 2.sv., porovnání 1.sv. a 2.sv.). We published the winner and the correct solution to the competition in April. Only one contestant predicted correctly. Thanks for your attendance. We look forward to your reply in May. 19.4.2012 We added this new specie: Tapinauchenius latipes. We currently have 286 species of tarantulas in the Gallery. We have new photos of following species: Cyriocosmus elegans (adultní samice 11.sv), Hapalopus triseriatus (10.sv. ), Chilobrachys huahini (adultní samice s kokonem) a Poecilotheria metallica (8.sv.). 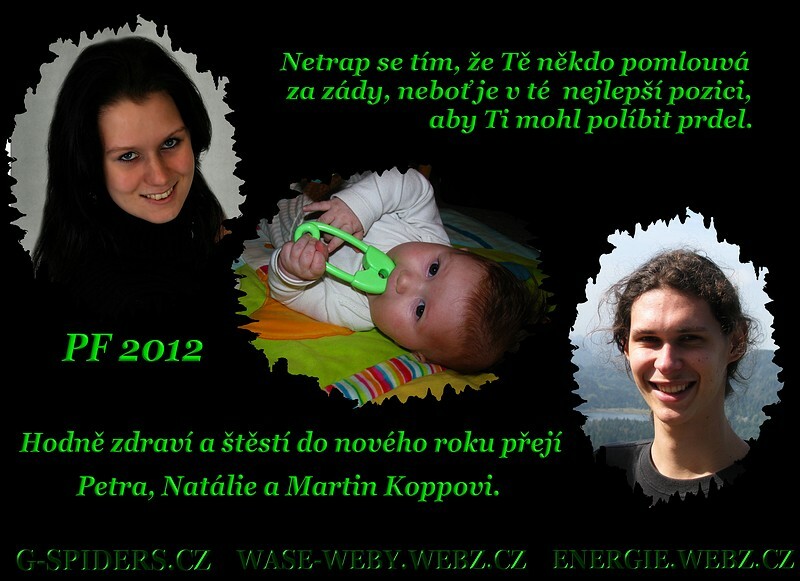 5.4.2012 We published the winner and the correct solution to the competition in March. Eight contestants predicted correctly. Thanks for your attendance. We look forward to your reply in April. 27.3.2012 We have new photos of following species: Aphonopelma anax (10.sv. ), Ami sp .Bolívie (9.sv., 12.sv. ), Cyriocosmus chicoi (10.sv. ), Fufius sp. (10.sv. ), Hapalopus cf. formosus (9.sv. ), Idiothele nigrofulva (adultní samice), Psalmopoeus irminia (adultní samice z Guyany), Selenocosmia arndsti (3.sv.) a Selenocosmia crassipes (6.sv., 7.sv.). 9.3.2012 We published the winner and the correct solution to the competition in February. Only three contestants predicted correctly. Sorry for the delay with the announcement of the competition and look forward to your reply in March. 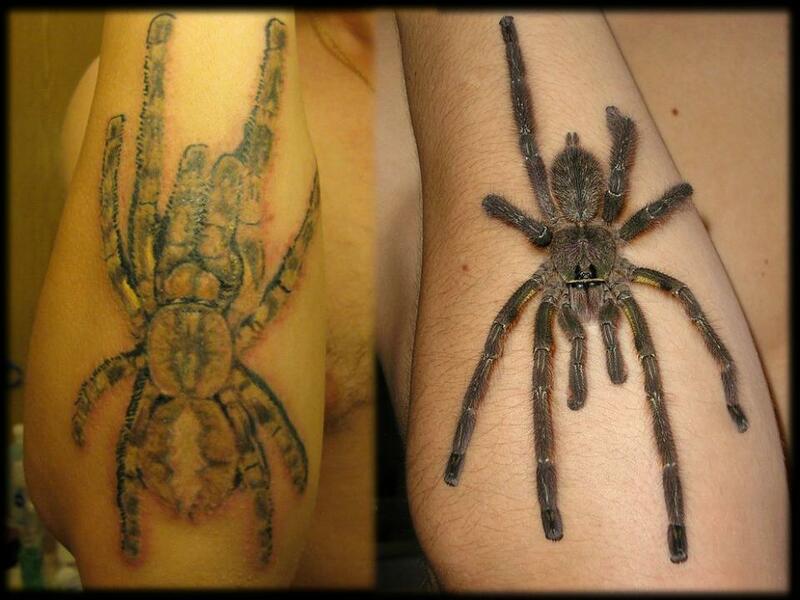 4.3.2012 We added young Theraphosa apophysis (1. molt) into our offer. 21.2.2012 We added this new specie: Androctonus bicolor. We currently have 72 species of scorpions in the Gallery. We have new photos of following species: Avicularia laeta (adultní samec, páření) a Grosphus madagascariensis (samice s mláďaty). 26.1.2012 We have new photos of following species: Haplopelma longipes (adultní samice, páření), Catumiri argentinense (adultní samice, adultní samec), Coremiocnemis sp. Fraser Hill (adultní samec, páření), Grammostola rosea RED (páření), Grosphus flavopiceus (samice s mláďaty, 1.sv. ), Haplopelma longipes (adultní samice, páření), Hysterocrates gigas (1.sv. ), Chilobrachys fimbriatus (1.sv. ), Metriopelma sp. Aragua (adultní samec), Metriopelma sp. Carabobo (adultní samec), Pamphobeteus sp. Kolumbie (adultní samec), Schizopelma sp. (adultní samec), Theraphosa apophysis (mládě v L2), Theraphosidae sp. Ecuador 17 (adultní samec) a Theraphosidae sp. Villa Tunari (námluvy, páření). 10.1.2012 We have new photos of following species: Acanthoscurria antillensis (adultní samice), Hysterocrates gigas (páření), Selenocosmia peerboomi (adultní samec), Tapinauchenius plumipes (samice s L2, L2) a Theraphosa apophysis (mláďata v L1). 4.1.2012 We added this new species: Grosphus madagascariensis, Chaerilius sp. Kuala Lipis. We currently have 71 species of scorpions in the Gallery. 29.12.2011 We added this new specie: Centruroides baracoa. We currently have 69 species of scorpions in the Gallery. We have new photos of following species: Brachypelma auratum (12.sv. ), Brachypelma emilia (13.sv. ), Ornithoctonus sp. Malthai (adultní samec), Pamphobeteus nigricolor (páření), Poecilotheria miranda (adultní samice 12.sv.) a Theraphosa apophysis (adultní samec, páření). 10.12.2011 Only three people successfully answered our competition question for the month of Nowember: Michaela Ševčíková, Lukáš Kunt and Jan Dvořák. Congratulate the winners! We chose a slightly more difficult assignment for December, but the first three successful researchers can look forward to Brachypelma annitha, Brachypelma smithi and for third place we have prepared Aphonopelma seemani. 3.12.2011 We have new photos of following species: Eupalaestrus weijenberghi (9.sv. ), Holothele sanguiniceps (detail adultní samice), Lasiodora difficilis (14.sv. ), Metriopelma sp. Aragua (7.sv. ), Plesiopelma sp. Bolívie (9.sv.) a Tapinauchenius plumipes (adultní samice). 20.10.2011 We have new photos of following species: Acanthoscurria geniculata (10.sv. ), Avicularia braunshauseni (adultní samec), Chilobrachys huahini (adultní samice 15.sv. ), Pamphobeteus antinous (8.sv. ), Pamphobeteus ultramarinus (spermatheca) a Tapinauchenius plumipes (1.sv., adultní samice, svlékání z L2 do 1.sv.). 18.10.2011 We have new photos of following species: Acanthoscurria atrox (adultní samice 13.sv. ), Aphonopelma waconum (9.sv. ), Hapalopus triseriatus "lowland" (3.sv. ), Heteroscodra maculata (1.sv.) a Thrixopelma pruriens (8.sv). 10.9.2011 We added this new specie: Acanthoscurria musculosa. We currently have 285 species of tarantulas in the Gallery. We have new photos of following species: Acanthoscurria sp. Bolívie (red) (3.sv. ), Cyriocosmus bertae (4.sv. ), Cyriocosmus perezmilesi (1.sv. ), Euathlus sp. Chile (orange) (samice s mláďaty), Heterothele villosella (4.sv. ), Kochiana brunnipes (4.sv. ), Metriopelma sp. Azuero (4.sv. ), Plesiophrictus raja (3.sv.) a Psalmopoeus langebucheri (2.sv.). 5.9.2011 Announcement of winners of competition in the month of August. 20.8.2011 We added these new species: Cyclosternum sp. Kolumbie a Theraphosidae sp. Ecuador "17". We currently have 284 species of tarantulas in the Gallery. We added this new specie: Cazierius parvus. We currently have 68 species of scorpions in the Gallery. We added this new specie: Acanthosaura lepidogaster. 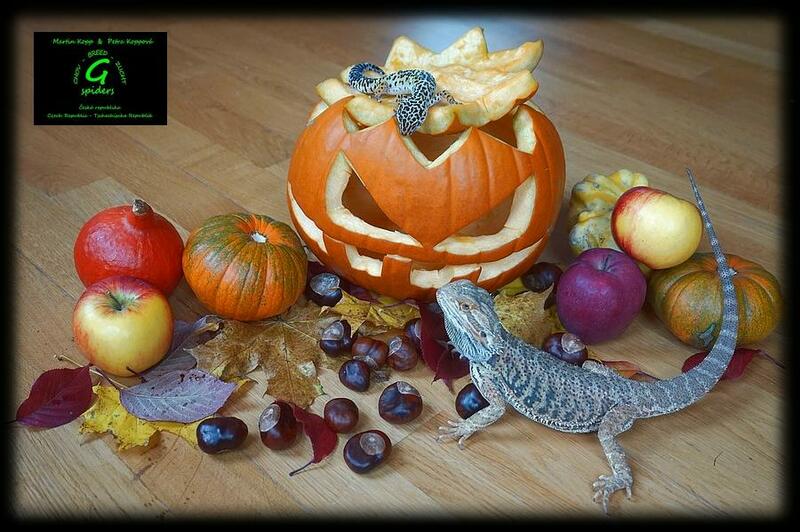 We currently have 5 species of reptiles in the Gallery. We have new photos of following species: Avicularia huriana (7.sv. ), Centruroides sculpturatus (odrostlé mládě), Cyriocosmus chicoi (8.sv. ), Cyriocosmus sp. Venezuela (adultní samec), Davus fasciatus (páření), Grammostola rosea RED (5.sv. ), Hapalopus cf. formosus (9.sv. ), Harpactira cf. curator (8.sv. ), Harpactira guttata (9.sv. ), Chilobrachys sp. Sai Yok (4.sv. a 5.sv. ), Chromatopelma cyaneopubescens (adultní samice 12.sv. ), Oligoxystre sp. Velvet Mountain (7.sv. ), Pamphobeteus nigricolor (námluvy), Poecilotheria pederseni (1.sv. ), Theraphosa apophysis (páření), Theraphosidae sp. Panama (3.sv. ), Theraphosidae sp. III (4.sv.) a Vitalius paraensis (7.sv.). 6.7.2011 We added these new species: Dipluridae sp. Abancay, Fufius sp., Ischnocolinae sp. Sana´a, Kochiana brunnipes a Plesiophrictus raja. We currently have 282 species in the gallery. We have new photos of following species: Acanthoscurria juruenicola (adultní samec), Catumiri argentinense (7.sv. ), Centruroides infamatus (1.sv. ), Cyriocosmus leetzi (adultní samice), Cyrtopholis ramsi (8.sv. ), Hadogenes paucidens (adultní samec), Hapalopus triseriatus "lowland" (3.sv. ), Heterometrus laoticus (svlékání), Hysterocrates cf. gigas (1.sv. ), Hottentotta gentili (adultní samec), Linothele curvitarsis (adultní samec), Psalmopoeus langebucheri (1.sv.) a Selenocosmia samarae (1.sv.). 2.7.2011 We added these new species: Agnostopelma gardel, Aphonopelma sp. Azuero a Cyriocosmus bertae. We currently have 277 species in the gallery. We have new photos of following species: Eucratoscelus pachypus (mláďě 1,5 cm v těle; import Tanzanie), Eupalaestrus weijenberghi (8.sv. ), Grammostola pulchripes (adultní samice 12.sv. ), Haplopelma schmidti (páření), Chilobrachys huahini (spermatheca), Pamphobeteus nigricolor (adultní samec), Phormictopus cubensis (6.sv. ), Poecilotheria formosa (11.sv. ), Poecilotheria metallica (6.sv. ), Poecilotheria ornata (3.sv. ), Sericopelma sp. Meg (5.sv. ), Theraphosidae sp. Ecuador CH (7.sv.) a Vitalius paraensis (5.sv.). Entering the competition for the month of July. 24.6.2011 We have new photos of following species: Avicularia azuraklaasi (7.sv. ), Brachypelma albopilosum (7.sv. ), Brachypelma verdezi (11.sv. ), Haplopelma minax (4 cm v těle), Phlogiellus sp. Palawan (4 cm v těle), Psalmopoeus cambridgei (1.sv. a adultní samice), Selenocosmiinae sp. Gunnung Ledang (adultní samec) a Theraphosa apophysis (adultní samice). 5.6.2011 We added these new species: Chilobrachys sp. Sai Yok a Selenocosmia samarae. 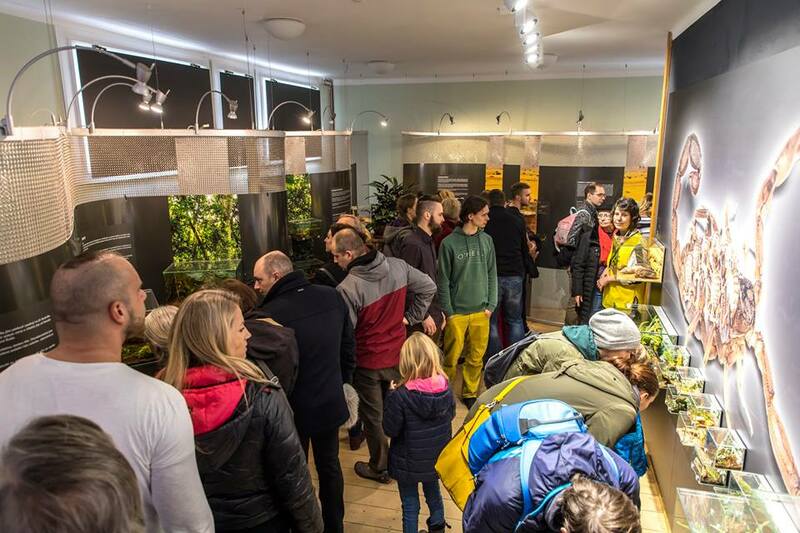 We currently have 274 species in the gallery. We have new photos of following species: Cyclosternum schmardae (L2), Euathlus sp. oranžový (adultní samice a páření), Eucratoscelus pachypus (páření), Haplopelma schmidti (spermatheca), Harpactira sp. red (páření), Cyriocosmus ritae (adultní samice), Psalmopoeus irminia (námluvy a spermatheca), Psalmopoeus pulcher (adultní samec), Psalmopoeus reduncus (páření) a Theraphosa apophysis (adultní samice, adultní samec a páření). 5.6.2011 Entering the competition for the month of June. 16.5.2011 We added new informations and photos to this articles: Odchov Chilobrachys andersoni, Odchov Psalmopoeus cambridgei a Odchov Psalmopoeus irminia . 6.5.2011 We added these new species: Lampropelma nigerrimum a Psalmopoeus langebucheri. We currently have 271 species in the gallery. 5.5.2011 We published the new rules of the competition. 3.5.2011 We have new photos of following species: Acanthoscurria geniculata (2.sv. ), Aphonopelma iodius (10.sv. ), Brachypelma albopilosum (adultní samec), Brachypelma emilia (13.sv. ), Cyriocosmus leetzi (námluvy a páření), Cyriocosmus ritae (adultní samice), Grammostola rosea (adultní samice - IMPORT CHILE), Plesiophrictus sp. Canaconas (adultní samec), Poecilotheria metallica (7.sv.) a Poecilotheria ornata (2.sv.). 1.5.2011 Entering the competition for the month of May. 28.4.2011 We have new photos of following species: Acanthogonathus pissii, Acanthoscurria juruenicola, Heteroscodra maculata, Linothele curvitarsis, Tapinauchenius plumipes, Thrixopelma ockerti, Xenesthis intermedia a Ttityus ecuadorensis. 13.4.2011 We added these new species: Centruroides arctimanus, Centruroides elegans, Centruroides sculpturatus, Centruroides vittatus, Hottentotta tamulus. 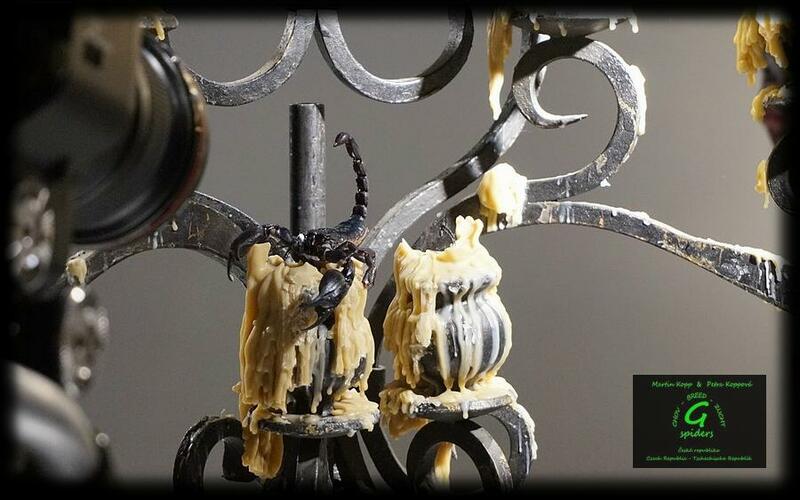 We currently have 67 scorpion species in the gallery. We have new photos of following species: Tityus stigmurus, Ttityus tamayoi. 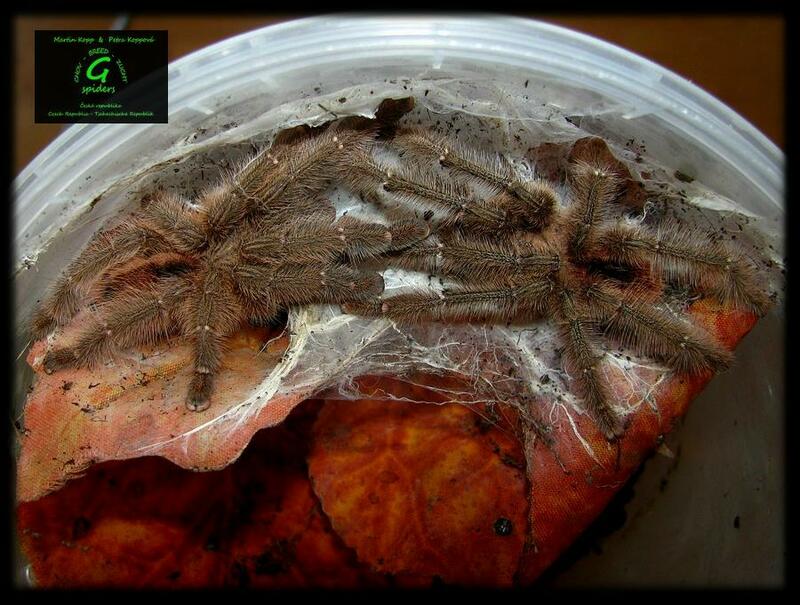 11.4.2011 We added these new species: Avicularia velutina, Selenocosmia crassipes a Theraphosidae sp. Panama. 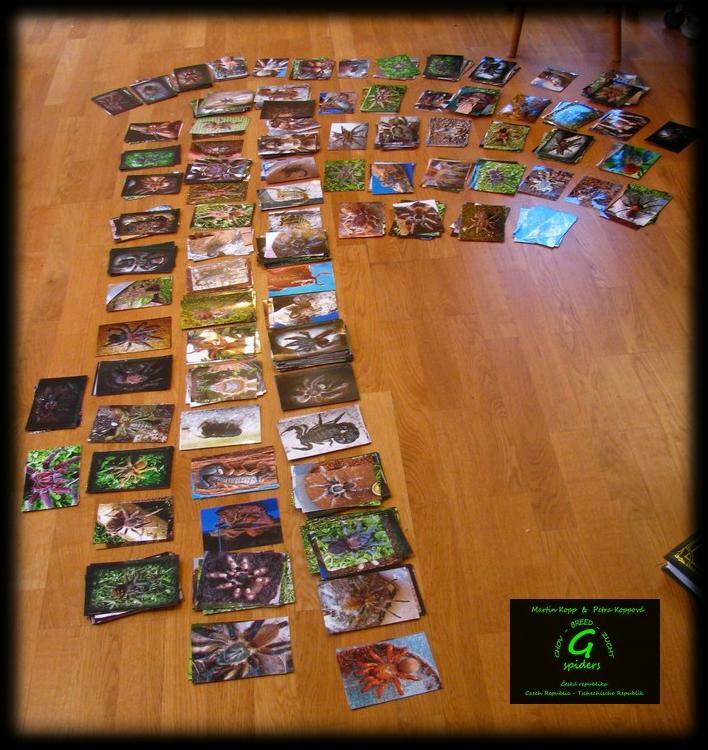 We currently have 269 species in the gallery. We have new photos of following species: Acanthoscurria insubtilis, Brachypelma smithi, Eupalaestrus campestratus, Holothele sanguiniceps, Chilobrachys fumosus, Poecilotheria subfusca, Tapinauchenius plumipes a Thrixopelma ockerti. Theraphosidae sp. Villa Tunari and Theraphosidae sp. Chapare are unified as: Theraphosidae sp. Villa Tunari. 8.4.2011 Correction and extension of Articles: Nejčastější otázky I (o sklípkanech obecně) a Nejčastější otázky II (péče o sklípkana). 6.4.2011 We have new photos of following species: Avicularia braunshauseni, Citharacanthus livingstoni, Cyrtopholis flavostriata, Harpactira cf. 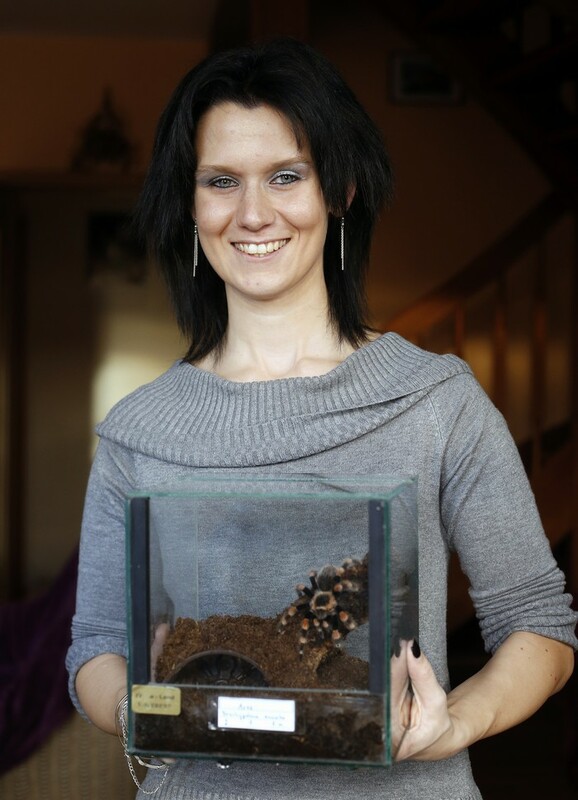 curator, Harpactira guttata, Metriopelma familiare a Phormictopus auratus. 4.4.2011 The first three places are already occupied in the competition in April. 27.3.2011 We added these new species: Thrixopelma pruriens, Vitalius paraensis, Yamia sp. Khao Lak a Yamia sp. Namtok Phlio. We currently have 267 species in the gallery. We have new photos of following species: Theraphosidae sp. Ecuador CH, Theraphosidae sp. Villa Tunari, Theraphosidae sp. I, Theraphosidae sp. III, Thrigmopoeus truculentus, Xenesthis immanis a Xenesthis intermedia. 23.3.2011 We added these new species: Selenocosmia arndsti, Sericopelma melanotarsum, Sericopelma sp. Azuero, Sericopelma sp. Meg a Theraphosidae sp. Villa Tunari. We currently have 263 species in the gallery. We have new photos of following species: Psalmopoeus reduncus, Pseudhapalopus spinulopalpus, Pterinochilus lugardi, Pterinochilus sp. Usambara, Selenocosmia peerboomi, Selenocosmiinae sp. Gunnung Ledang, Stichoplastoris sp. Costa Rica, Tapinauchenius plumipes a Theraphosa blondi. 16.3.2011 We have new photos of following species: Babycurus gigas, Buthus intumenscens, Caraboctonus keyserlingi, Centruroides balsasensis, Centruroides infamatus, Centruroides limbatus, Centruroides nitidus, Hadogenes paucidens, Hadrurus arizonensis, Hottentotta gentili, Iurus dufoureius, Liocheles australasiae, Ophistophthalmus boehmi, Pandinus cavimanus a Tityus serrulatus. 15.3.2011 We have new photos of following species: Psalmopoeus cambridgei, Psalmopoeus irminia a Psalmopoeus reduncus. 1.3.2011 We added these new species: Orphnaecus sp. Cebu a Phormictopus cubensis. We currently have 258 species in the gallery. We have new photos of following species: Orphnaecus sp., Pamphobeteus vespertinus, Paratropididae sp. Bolivie, Phormictopus antillensis, Phormictopus auratus, Plesiopelma sp. Bolívie, Plesiophrictus sp. Canaconas, Plesiophrictus sp. Margao, Poecilotheria fasciata, Poecilotheria formosa, Poecilotheria metallica, Poecilotheria miranda, Poecilotheria ornata, Poecilotheria regalis, Poecilotheria subfusca a Poecilotheria tigrinawesseli. 25.2.2011 We added these new specie: Mygalomorphae sp. La Paya. We currently have 256 species in the gallery. 25.2.2011 We have new photos of following species: Idiops cf. syriacus, Lasiodorides polycuspulatus, Metriopelma sp. Barinas, Mygalomorphae sp. Gordo, Nhandu chromatus, Oligoxystre sp. Velvet Mountain a Ornithoctonus aureotibialis. 15.1.2011 We added these new specie: Ami sp. 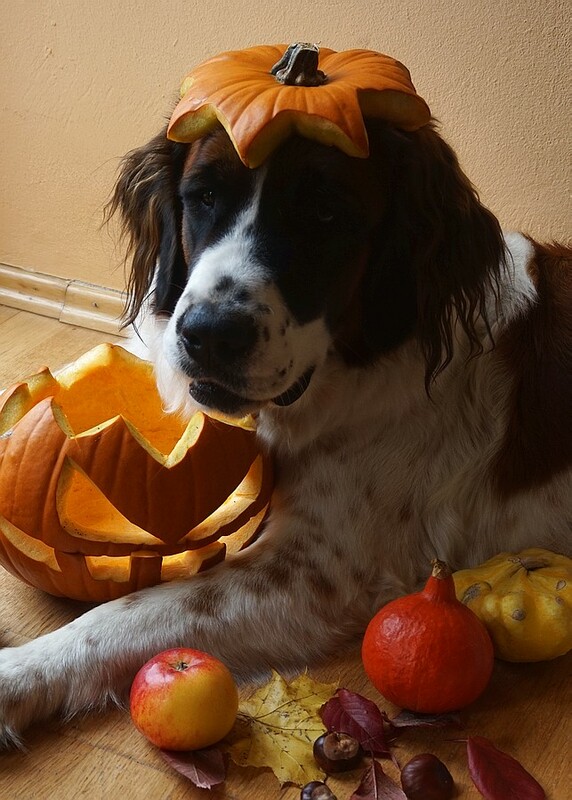 Bolívie. We currently have 255 species in the gallery. 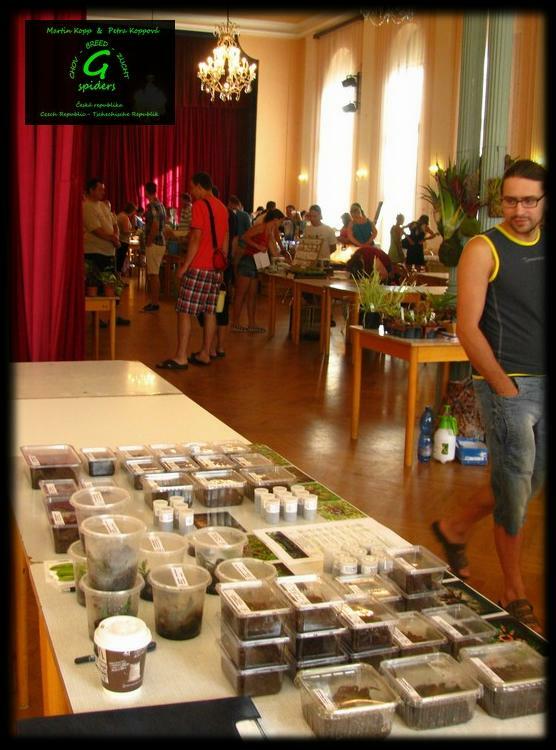 15.1.2011 We have new photos of following species: Acanthogonathus pissii, Acanthoscurria antillensis, Acanthoscurria geniculata, Aphonopelma anax, Aphonopelma caniceps a Aphonopelma waconum. 9.1.2011 The first three places in the competition is still vacant. 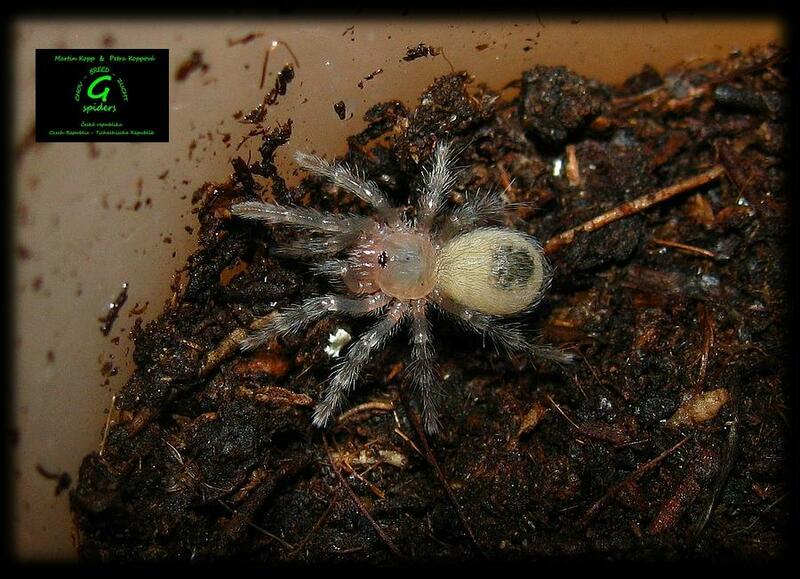 7.1.2011 We have new photos of following species: Ceratogyrus marshalli, Grammostola mollicoma, Hapalopus cf. formosus, Schismatothele sp. Venezuela, Schizopelma sp. a Sphaerobothria hoffmani.